Images and film shot on assignment for Caritas Australia as part of the Project Compassion 2018 appeal. 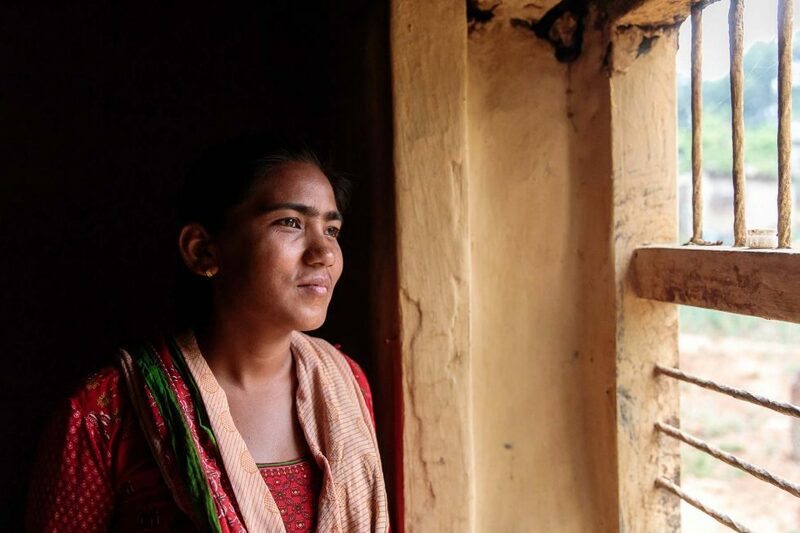 Janaki was forced to marry at 12 years old into an abusive family in Surkhet district, Western Nepal. Despite losing her husband three years later and being ostracised by her community, she now runs a successful tailoring business and is a strong advocate against domestic violence and forced marriage. Janaki was at school when her family situation changed her life. ‘While I was studying, our economic status was poor and my parents had to go to India for medical treatment. Being the eldest, I had to manage all the household work and send my brother and sisters to school, after that I could to go school.” Janaki said. Then her grandparents followed tradition and forced Janaki into an arranged marriage with abusive in laws. Her mother and father were unaware about her marriage, but her grandparents insisted she was married before their death. ‘Although I used to give my best, my father and mother in law were never satisfied and they used to scold me for no reason. I used to share my pain with my husband but he used to say to me to ignore these thing and convince me by saying they are old so not to take it seriously.’ she said. 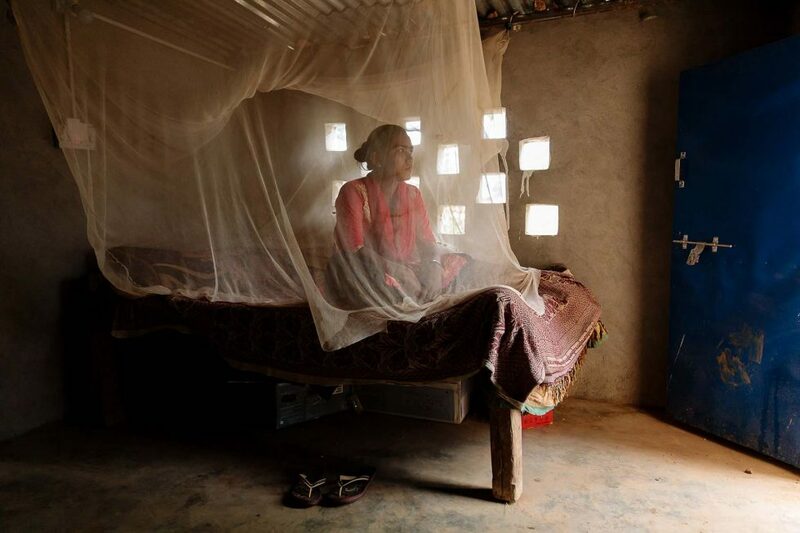 Janaki pictured sitting on her bed at her family home in Surkhet district in Western Nepal. 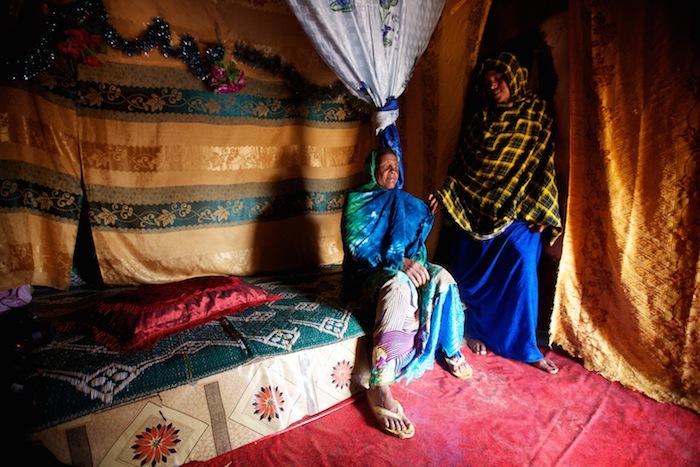 Janaki returned home after being forced into marriage aged 12 and her husband died three years later from typhoid. 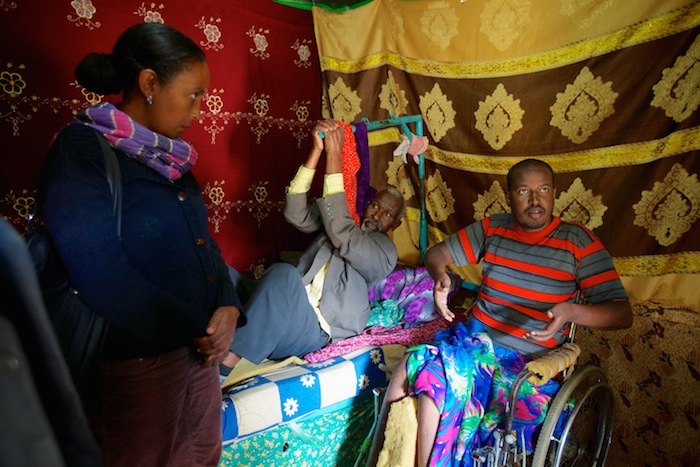 Three years into the marriage, her situation became even more precarious when her husband fell ill with typhoid. They couldn’t afford to get him medical treatment and he died. 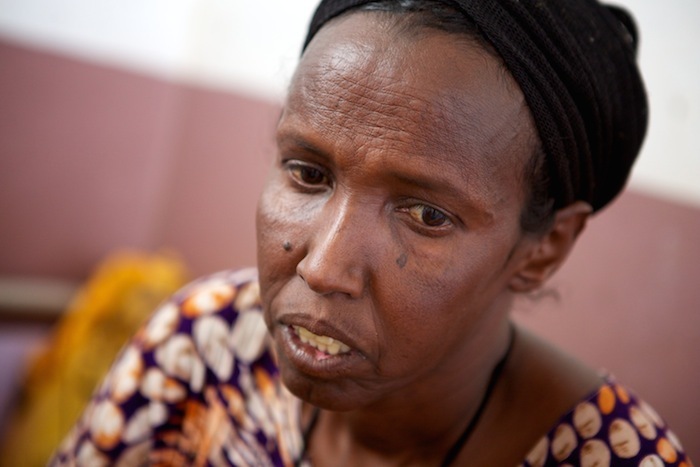 Her in laws blamed her for his death and she was ostracised by them and her community. 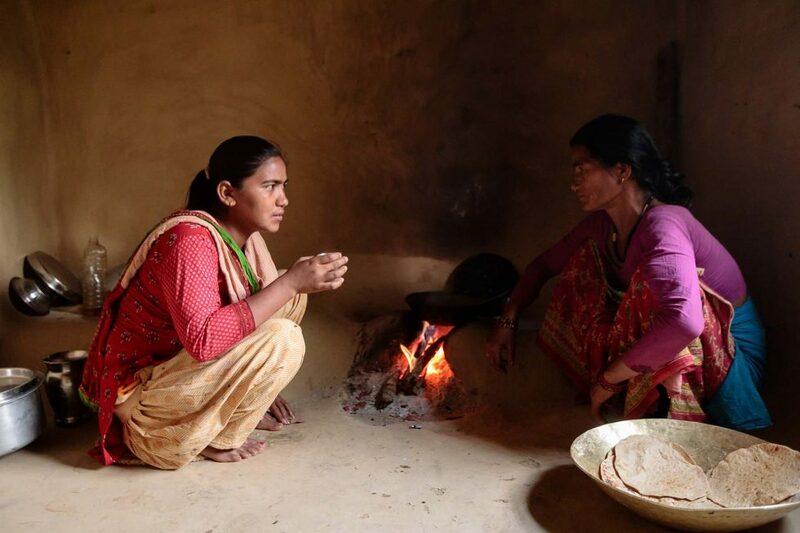 Janaki talks with her mother Khima in their kitchen. Khima and her husband, Dhan where in India seeking medical care when the grandparents followed tradition and arranged for Janaki to be married aged 12. 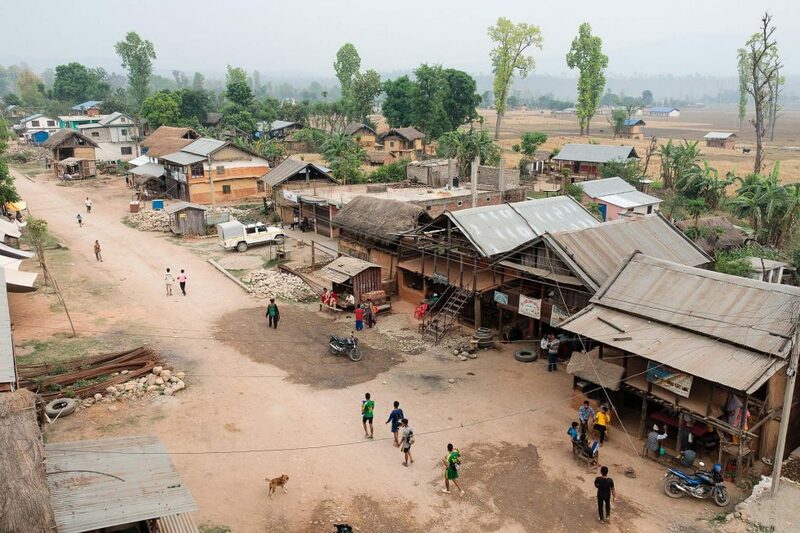 A view overlooking the main street in the town where Janaki lives in Surkhet district, Western Nepal. 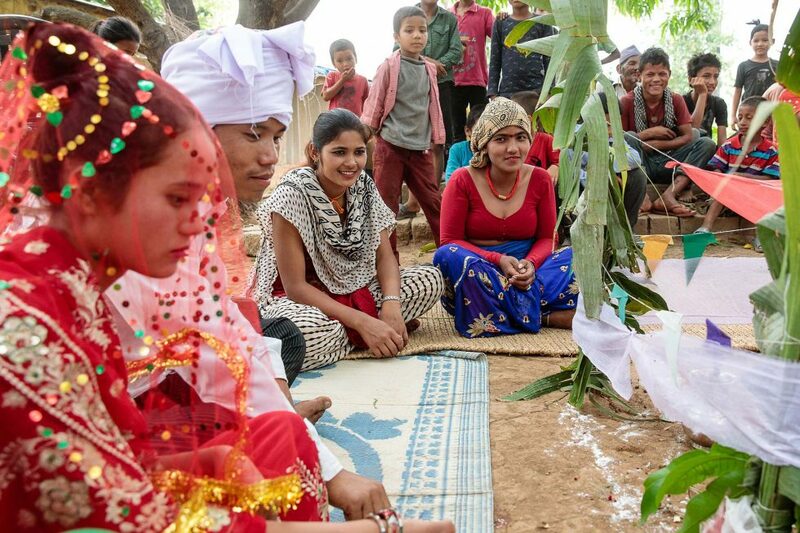 High levels of poverty and traditional practices contribute to the elevated incidents of child marriage. 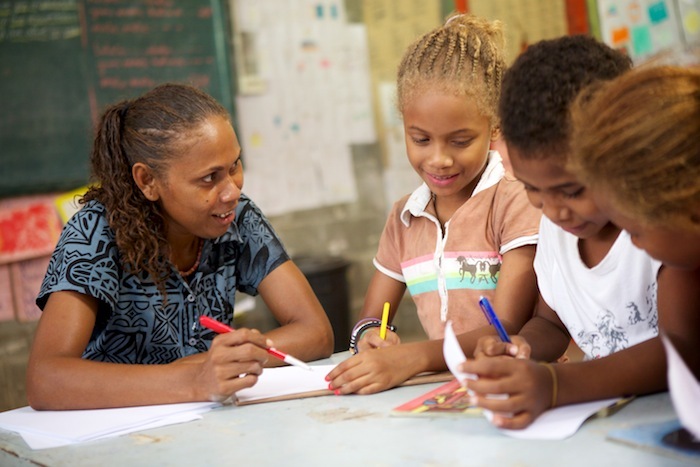 After meeting a local Caritas staff member, Janaki was encouraged to join a youth club, run by the Ekata Foundation in her village as part of their Children and Youth Empowerment Program (CYEP). CYEP helps over 14,000 children and young people each year. It increases the knowledge and leadership qualities of children and youth from disadvantaged families, through the formation of clubs, information centres, networks and libraries. It also provides jobs skills and helps them to create income-generating projects. Through the club Janaki gained access to a tailoring course and after three months she was one of the best students from the forty participants. The club then organised a loan to buy a machine and she set up her own business. Janaki was encouraged to join a youth club as part of the Caritas Australia, Children and Youth Empowerment Program (CYEP) which improved her confidence and provided her with sewing training and on completion, a loan to buy her own machine. Janaki (left) demonstrating cutting techniques to Khagisara, one of her trainees. Janaki teaches other vulnerable women and youth in her community how to sew so they too can be empowered and earn a living. Eight years on and Janaki now has eleven machines and runs her business from a workshop next to the family home. She is repaying her loan and can afford to look after her family and support her brothers and sisters with their education. Feeling the need to help others, she also trains eighteen other vulnerable women, many victims of child marriage themselves, to allow them a fresh start in life. Janaki with her trainees, many of whom have experienced child marriage or domestic violence. Janaki now runs a successful business and has 11 sewing machines to use for her classes. With increased confidence in herself, Janaki joined the committee at her youth network and soon became its leader. She started to help organise regular campaigns looking into issues affecting their community such as child marriage, domestic violence and workers’ rights. Janaki (centre) and other members of the Youth Network walk through their village to put up advocacy posters about the issue of child marriage. Janaki putting up an anti-child marriage poster as part of a youth club initiative. 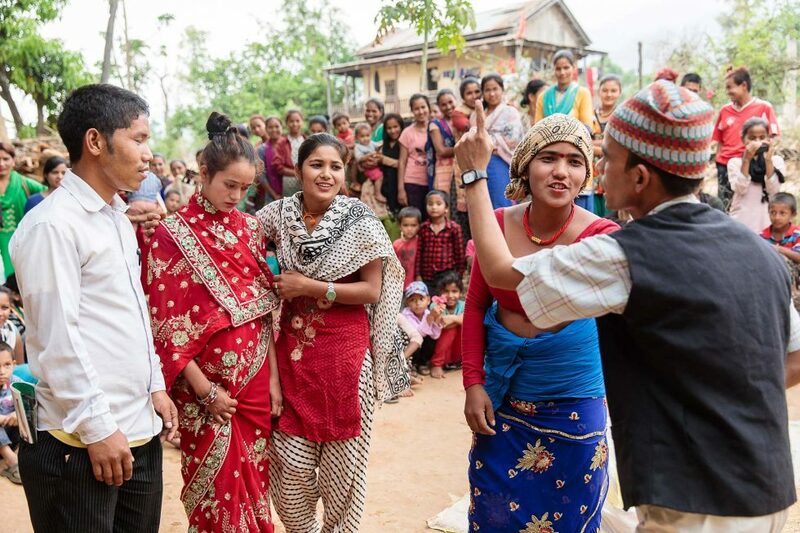 The youth club also stages regular dramas for the community as an educational tool to raise awareness and to facilitate group discussion on sensitive subjects, such as child marriage. Members of the youth club re-enact a child marriage. Janaki (right) plays the mother in a drama about the issues of child marriage organised by the Youth Network in front of the local community. The community now see Janaki as a role model and a strong vocal advocate against domestic violence and forced marriage. With increased confidence and skills, Janaki has become a leader in the Youth Club and an inspiration to other young people. Donations can be made through the link above. 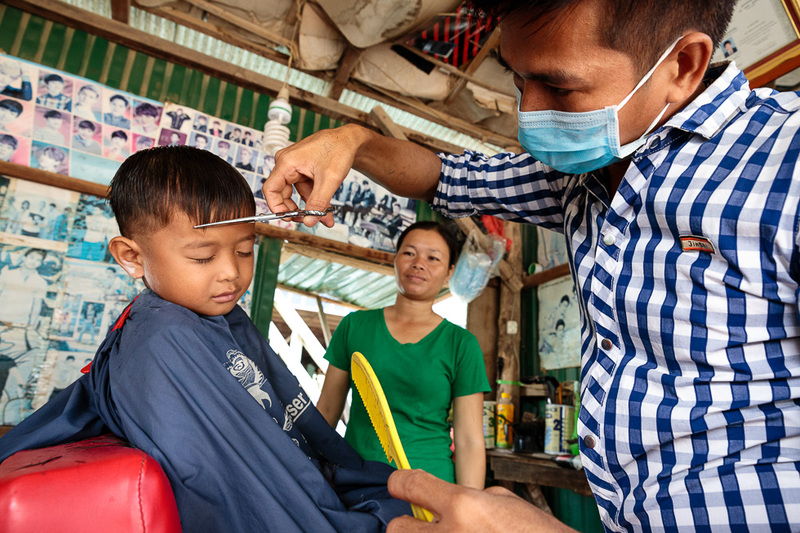 Rattanak is a skilled young barber, living an independent life in rural Cambodia. But it wasn’t always that way. As a child he contracted polio and also became deaf. 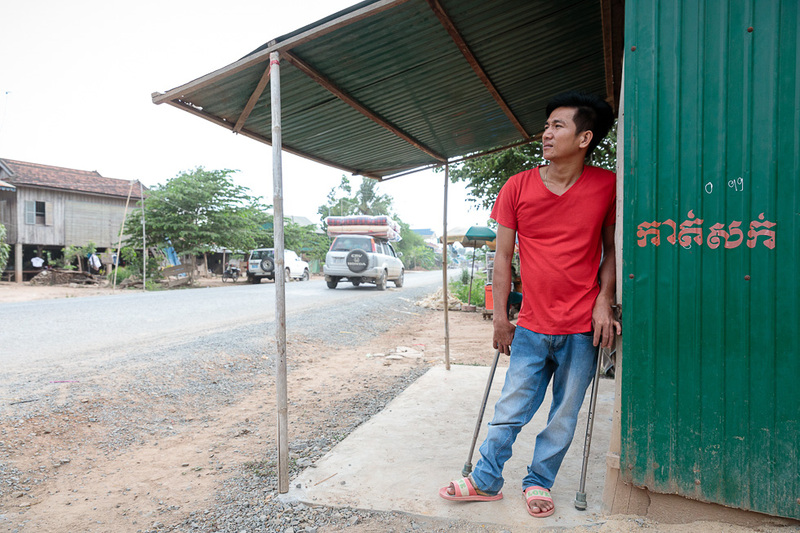 Like many people who are deaf or hard of hearing, Rattanak faced isolation at home, unable to communicate with his family or community until being introduced to the Deaf Development Program (DDP), based in Phnom Penh, the capital of Cambodia. There are over 51,000 deaf people in Cambodia but DDP is the only deaf training school open to adults. The Deaf Development Program (DDP) is run by Caritas Australia partner, Maryknoll Cambodia, and provides sign language, job training and interpreting services to people aged 16 and over who are deaf or hard of hearing. The centre is also raising awareness about deafness in wider Cambodian society. Rattanak inside his barber shop in Kandal province, Cambodia. Most students in DDP spend two years learning Khmer sign language, literacy, numeracy and life skills then spend a year on a job training course such as sewing, cooking, barbering, wood carving, metal crafts, electrical fan repairing, beauty and hair dressing. The aim is to give deaf people a path to an independent future. 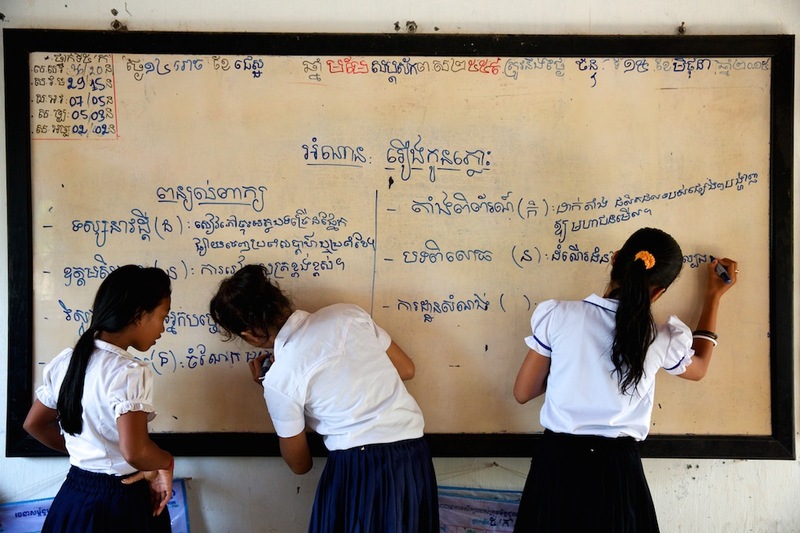 Students are taught Khmer sign language at the Deaf Development Program (DDP) school in Phnom Penh. Students are taught Khmer sign language by DDP teacher Sokhary at the Deaf Development Program (DDP). 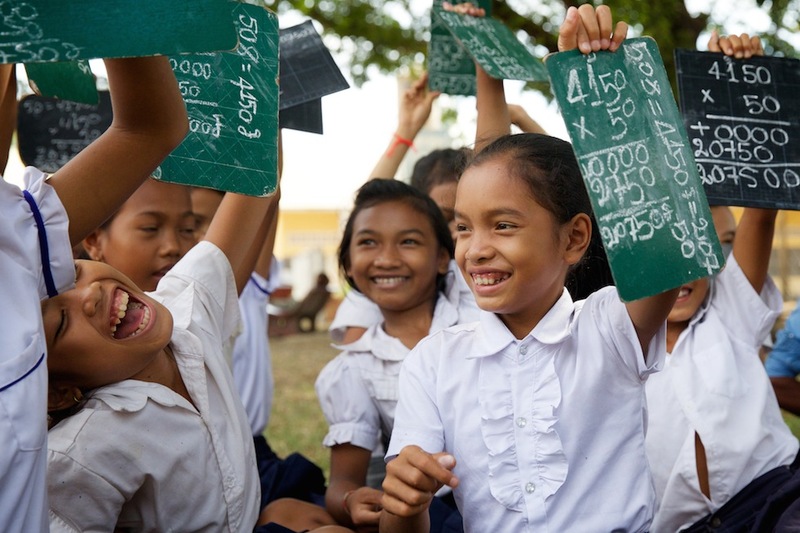 Students are also taught how to write in Khmer and take maths and social science classes as part of the two year course. Students are taught Khmer sign language by DDP teacher Sokhary at the Deaf Development Program (DDP) school in Phnom Penh, the capital of Cambodia. 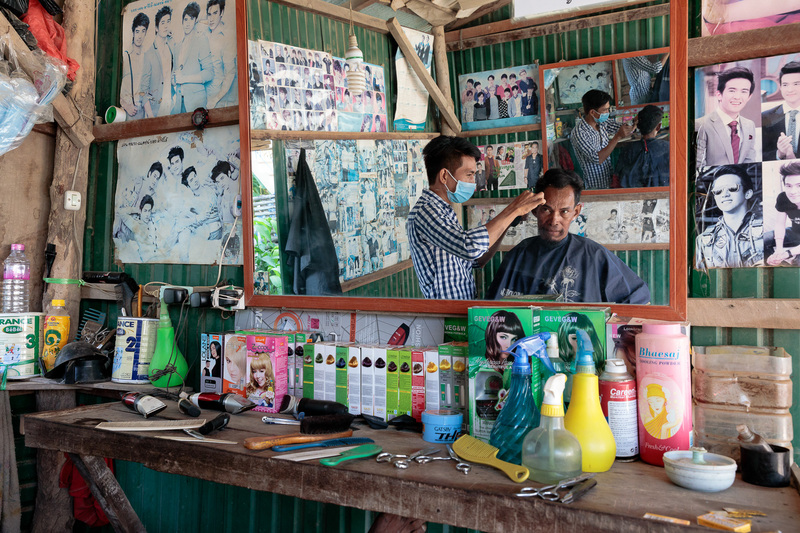 DDP set up a Barber Shop next to their head office in Phnom Penh to enable their students to gain practical experience. The trainees practice on each other and the general public can also walk in for a discounted hair cut. 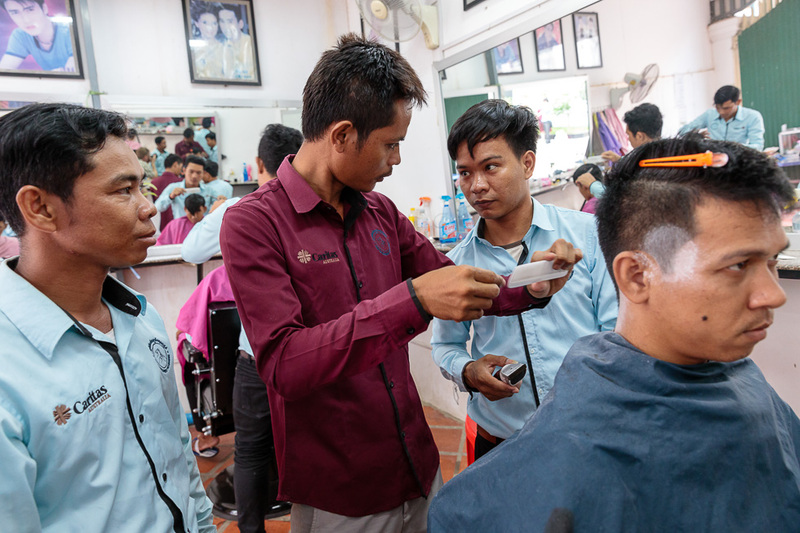 Trainees are taught how to cut hair in the Deaf Development Program (DDP) job training project Barber Shop which is located next to the head office of DDP in Phnom Penh. Students of the Deaf Development Program’s barber course getting practical experience, enabling them to master their trade. Rattanak studied Cambodian sign language, Khmer writing, social sciences and maths, for two years before learning his trade as a barber. 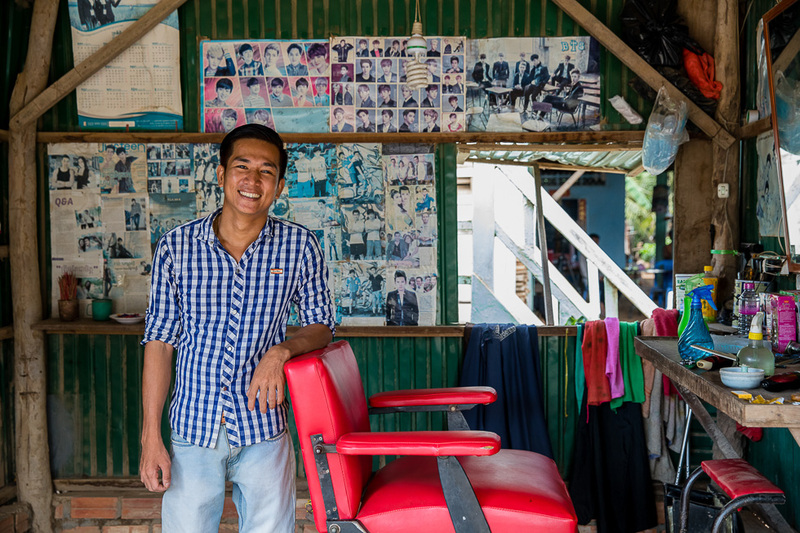 After graduating in 2012, he set up a barbershop outside his family home about an hours drive from Phnom Penh, which has since proven to be highly successful. Rattanak cutting a clients hair in his barber shop which is located in front of his home in Kandal province, Cambodia. “Because of DDP, I’ve had the opportunity to develop and to learn and increase my knowledge, now I’m much more confident in everything that I do,” Rattanak says. Rattanak cuts a young boys hair with his mother looking. 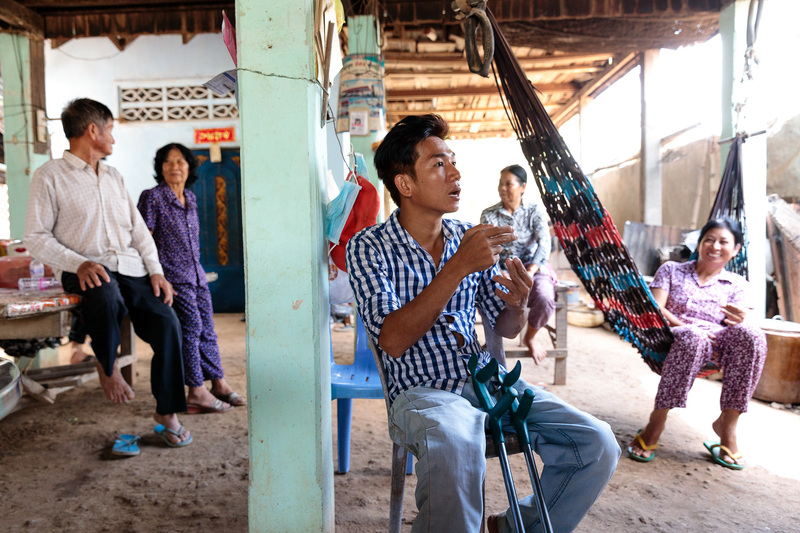 Rattanak learnt valuable technical skills from the Deaf Development Program and runs a successful barber shop. 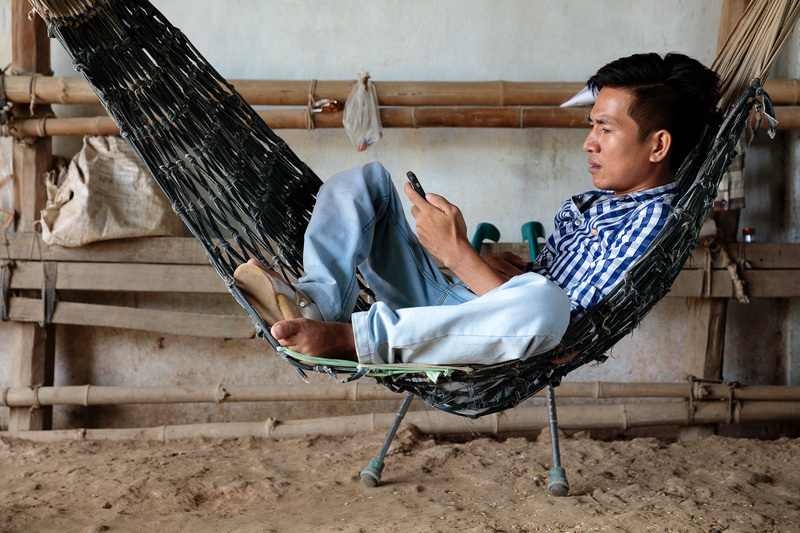 Rattanak checks his social media accounts on his phone whilst waiting for clients at his home in Kandal province, Cambodia. Social media became a big part of Rattanak’s life to not only communicate with friends but also watching educational YouTube videos about hairdressing. After he was introduced to his wife hearing Phirom, he used to talk to her through social media and after they were married in 2016 he taught her sign language. They are now expecting their first baby. Rattanak with his wife Phirom in their home in Kandal province, Cambodia. 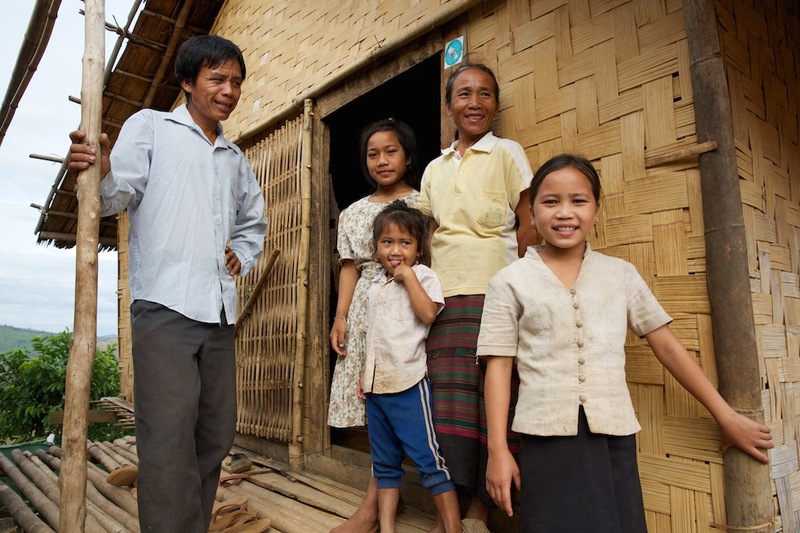 Rattanak (centre) communicates with family members in their home in Kandal province, Cambodia. 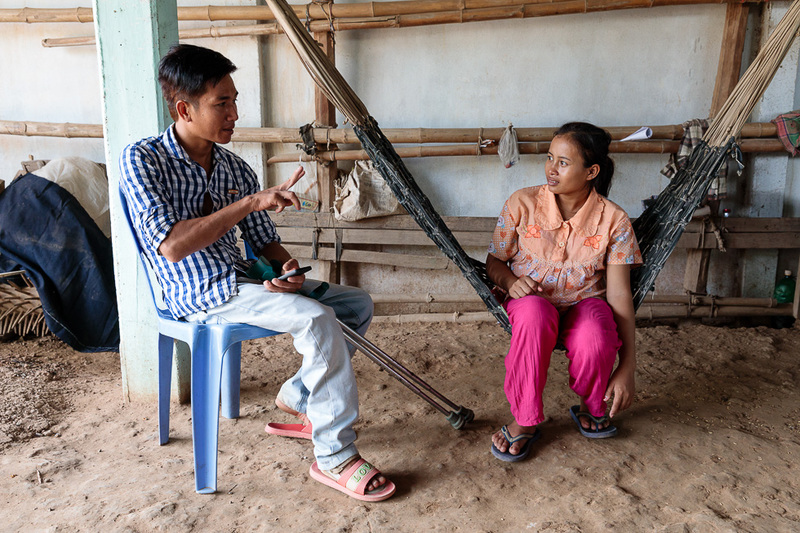 After finishing his training with the Deaf Development Program, Rattanak is now able to sign in Khmer and has a thriving business styling hair. 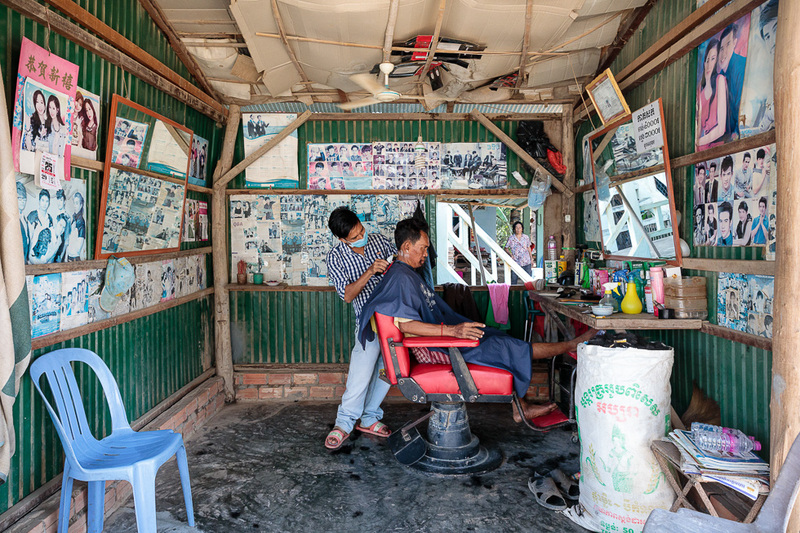 Rattanak waits for clients outside his barber shop in Kandal province, Cambodia. 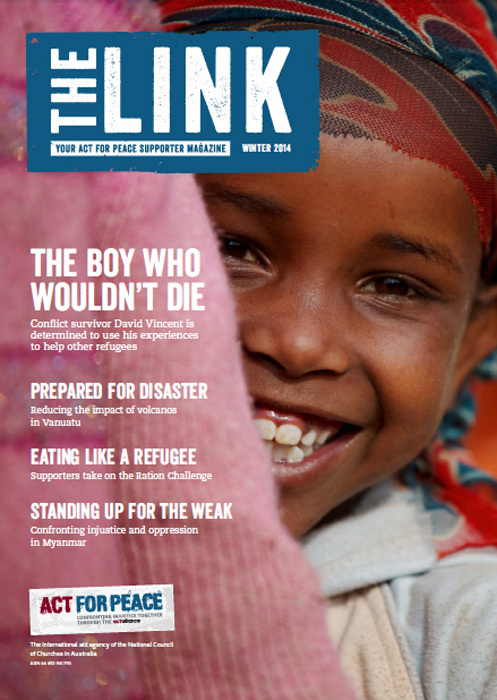 The Rohingya refugee crisis was the focus of the 2018 Act for Peace Christmas Bowl Appeal. 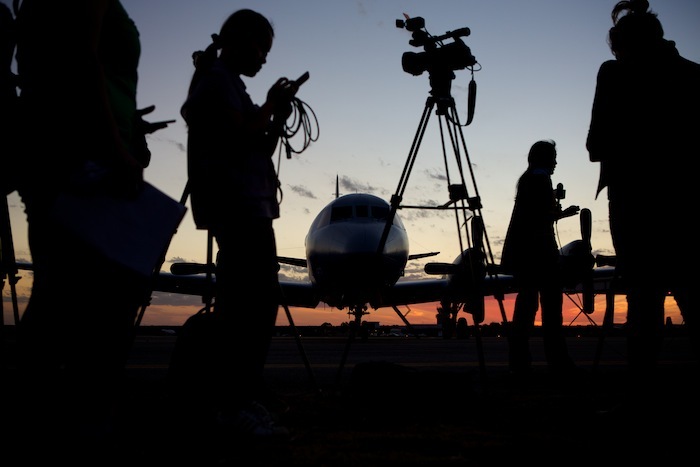 I travelled with Act for Peace CEO Janet Cousens to Jamtoli refugee camp in Bangladesh to document how their partner CAID were providing assistance to the more than 52,000 people who had sought shelter there. 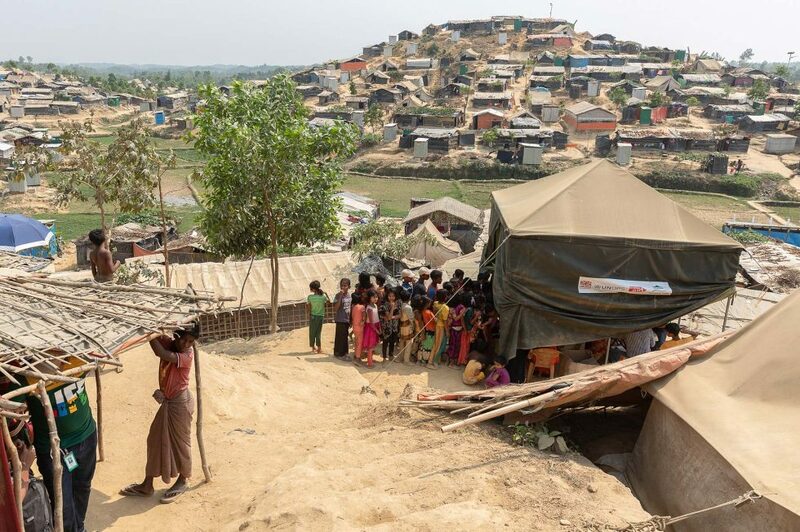 Jamtoli is just one of many camps that now provide shelter for over 700,000 refugees who fled Myanmar following an upsurge in violence in August 2017 by the Myanmar army in the state of Rakhine. Below are some of the images and an appeal film shot during our time there. It was the 65th anniversary of the Christmas Bowl this year so if you’d like to make a donation please click on Christmas Bowl 2018. Ayesha (23) sits with her daughters Hasina (2) and Shafiqa (5) in their shelter in Jamtoli Rohingya refugee camp in Cox’s Bazar, Bangladesh. Her son Sami, who was 16 days old when the Myanmar army attacked her village, died during the journey to Bangladesh. Ayesha (23) and her family were one of the first families we met in the camp. 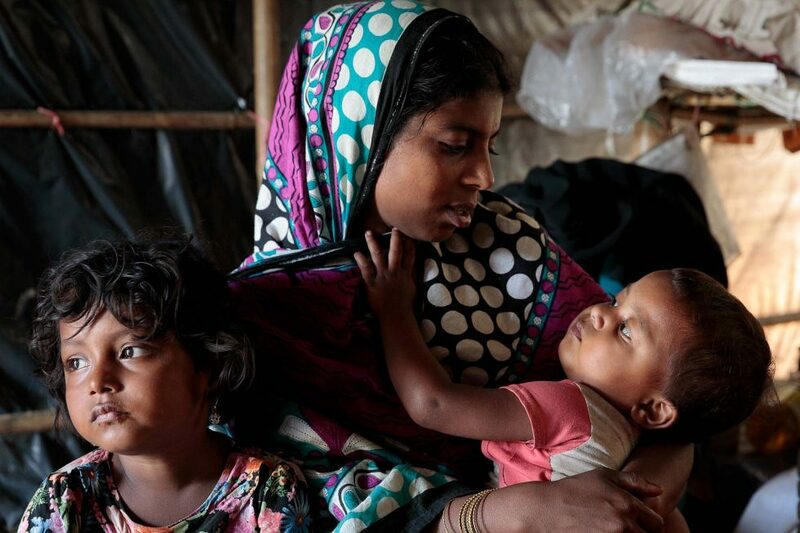 Whilst cradling her youngest daughter Hasina (2), Ayesha told us how she had given birth to her son Sami 16 days before the Myanmar army attacked her village. 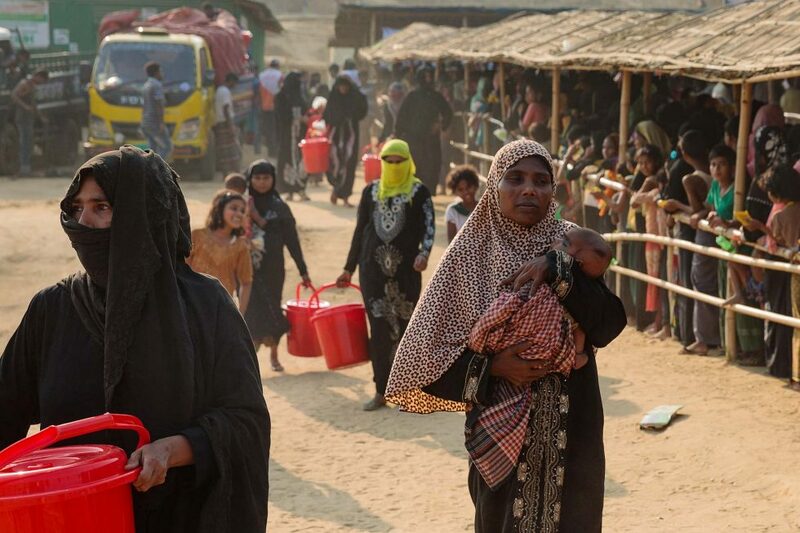 She had to flee at night in the rain with her husband Zubai (26) and her two daughters Shafiqa (5) and Hasina (2), towards the Naf river, hoping to cross into Bangladesh. 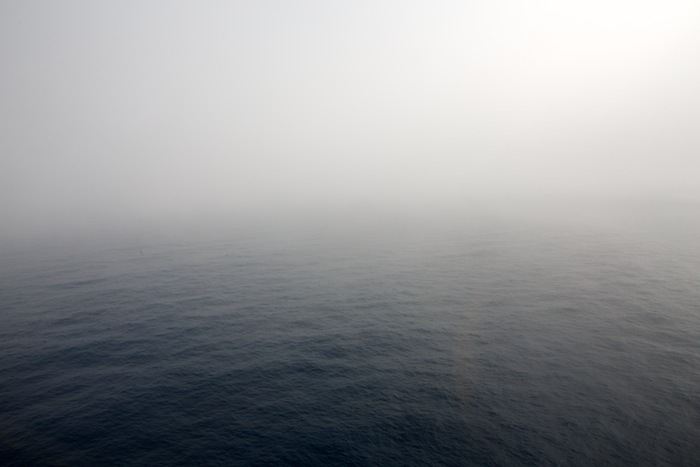 With few possessions and no money, they had to pay a boatman with their remaining marital gold to cross the river, but the water levels were so low they had to jump into the river and cross the mud flats. Her children became wet and covered in mud but had no choice but to continue. 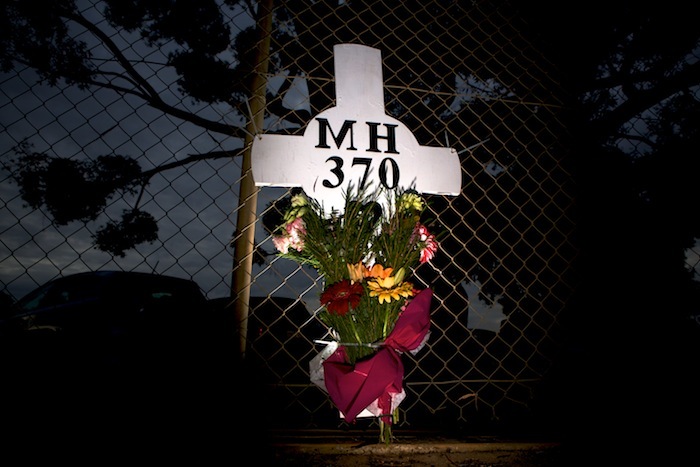 When they eventually made it to the safety of Bangladesh there wasn’t any food, water or shelter. He son Sami died soon after from being exposed to the wet and cold. 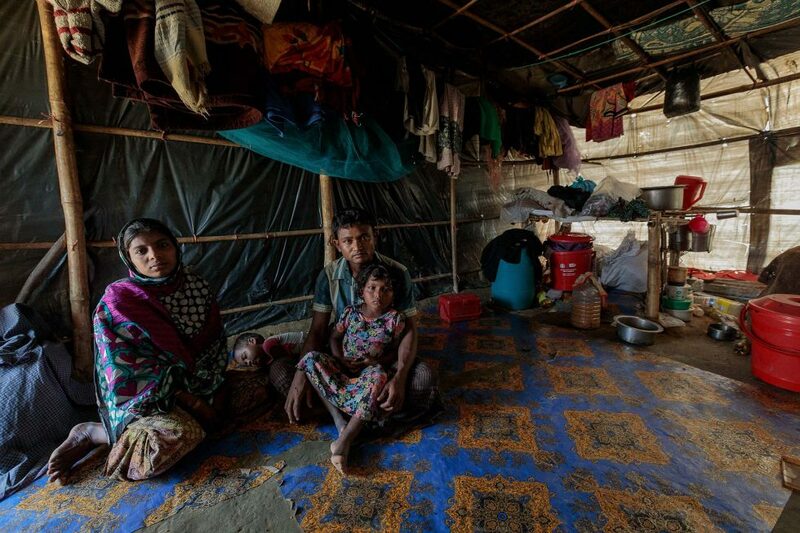 Ayesha (23) with husband Zubai (26) and daughters Shafiqa (5) and Hasina (2) in their shelter in Jamtoli Rohingya refugee camp in Cox’s Bazar, Bangladesh. They lost most of their possessions when fleeing their village. 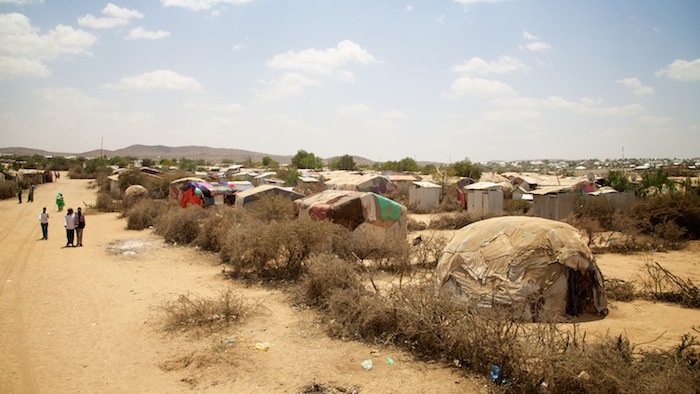 They were eventually directed to Jamtoli where a new spontaneous settlement was growing daily during those first few chaotic weeks of the crisis and were allocated a shelter. 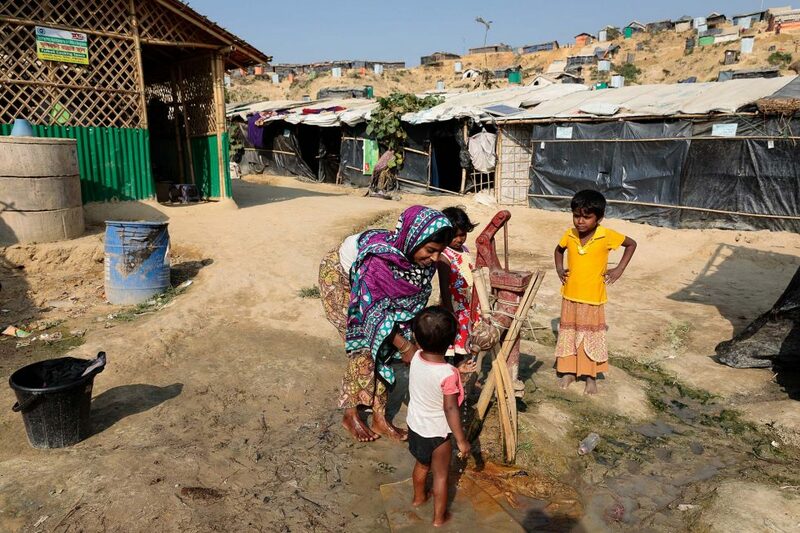 Ayesha (23) bathes her daughter Hasina (2) outside her home which is next to the Community Kitchen in Jamtoli Rohingya refugee camp in Cox’s Bazar. Eight months on and Ayesha now has access to water and food and the family have been provided with cooking and hygiene materials from aid agencies such as Act for Peace but life remains harsh in the cramped and unhealthy conditions of the camp and there is little hope of a safe return anytime soon. Ayesha (23) looks out of her shelter in Jamtoli Rohingya refugee camp. Ayesha had given birth to her son Sami 16 days before the Myanmar army raided her village forcing her family to flee into Bangladesh. Due to the arduous journey in cold weather and lack of food and water, Sami didn’t survive. On the two hour daily drive south from the city of Cox’s Bazar you pass the sprawling mega camp of Kutupalong and on first arriving at Jamtoli camp it can seem overwhelming and disorientating to the senses. 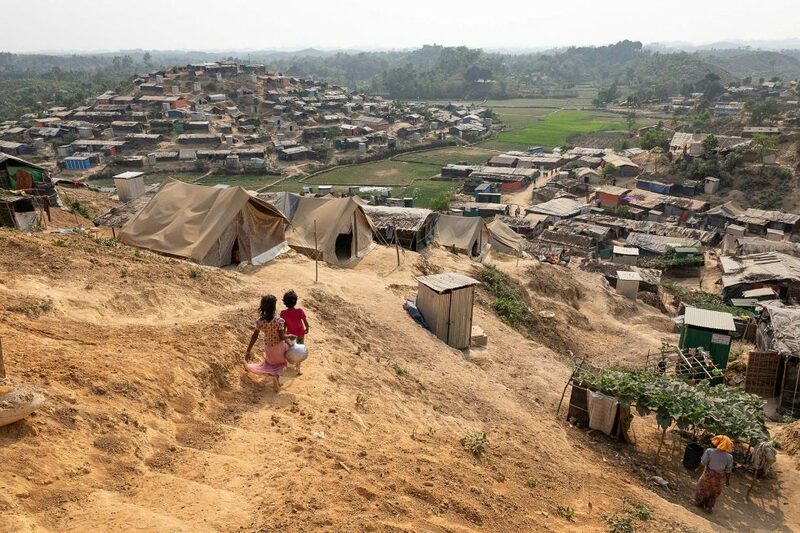 Looking at the barren, denuded hills crammed with endless shelters constructed of plastic sheeting and bamboo, it’s hard to image that Jamtoli was once a small, thickly forested farming village of local-born ethnic Bangladeshis. 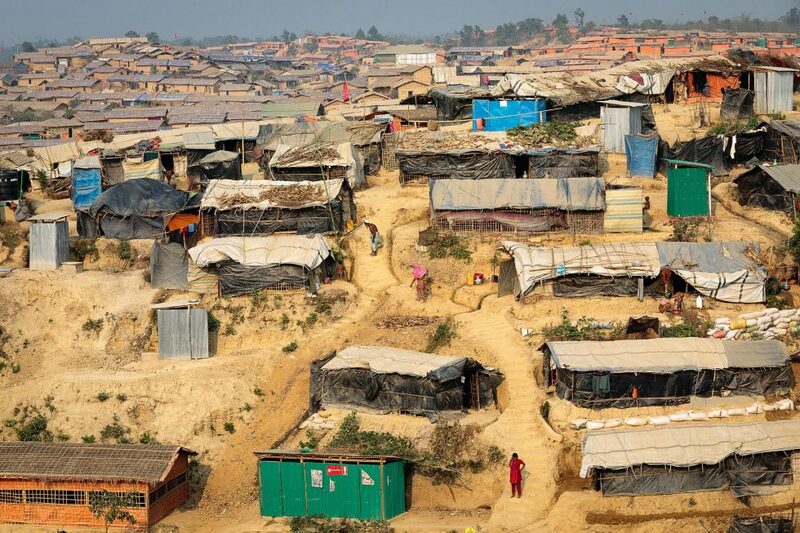 Jamtoli Rohingya refugee camp is now home to over 57,000 and exists just south of the mega camps that host over 700,000 in the region of Cox’s Bazar, Bangladesh. 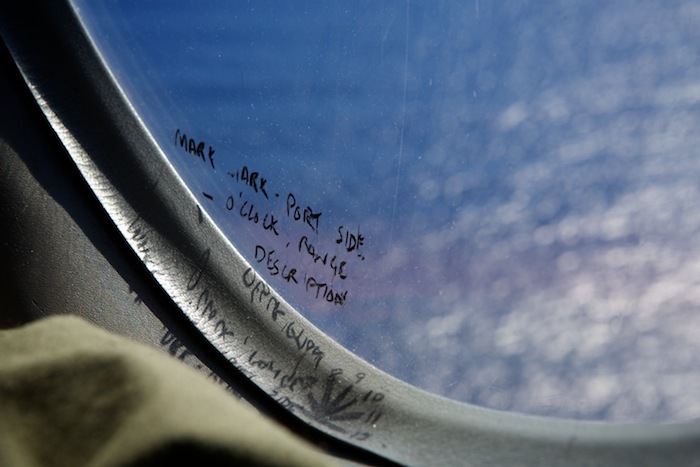 Inside every one of the shelters, a story of loss and tragedy can be found but also of survival and resilience. 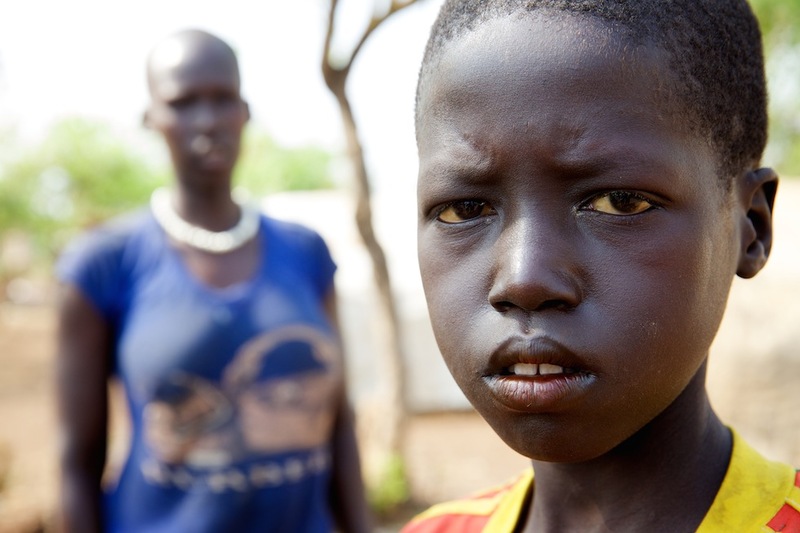 Mohammed (12) and his sister Noor (10) were at home the night their village was attacked and their family fled to the Naf river. As they hid on the banks, looking for a way to cross, they were fired upon. 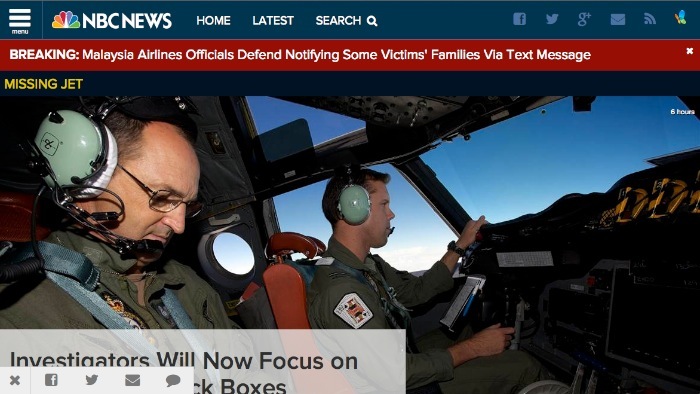 They saw their mother and father shot dead and then their youngest brother was also killed. They now live with their uncle and his extended family. With very few psycho social services available in the camp, they go to a Women and Child Friendly Space each day to try and regain some sense of normality in their lives and be children again. 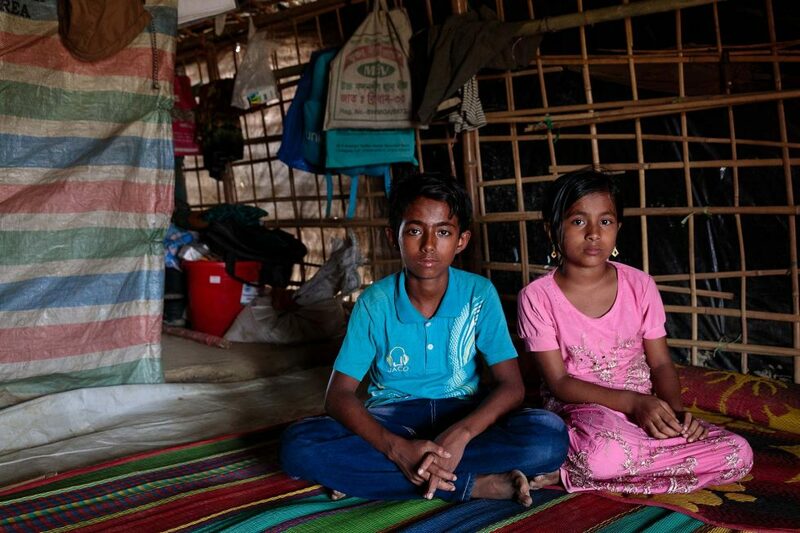 Mohammed (12) and his sister Noor (10) are pictured inside their tent in Jamtoli Rohingya refugee camp in Cox’s Bazar. 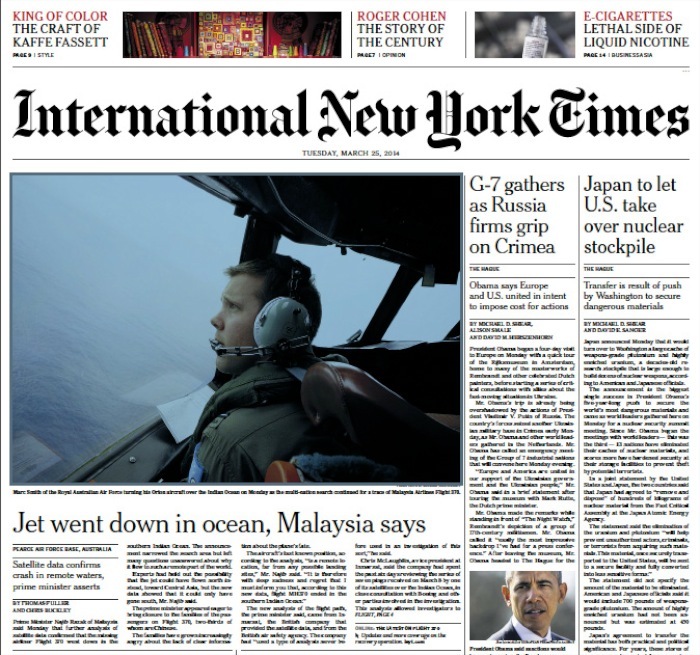 They saw their parents and youngest brother shot dead whilst trying to cross into Bangladesh. They now live with their uncle and extended family. Children arrive at one of the Women and Child Friendly Spaces. 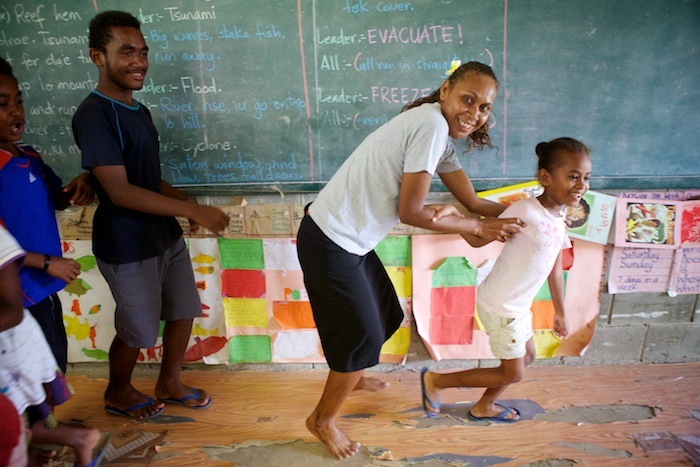 The centres provide a safe place to go and participate in activities such as drawing, telling stories, ABC’s and indoor games and is run by Act for Peace partner Gana Unnayan Kendra (GUK). 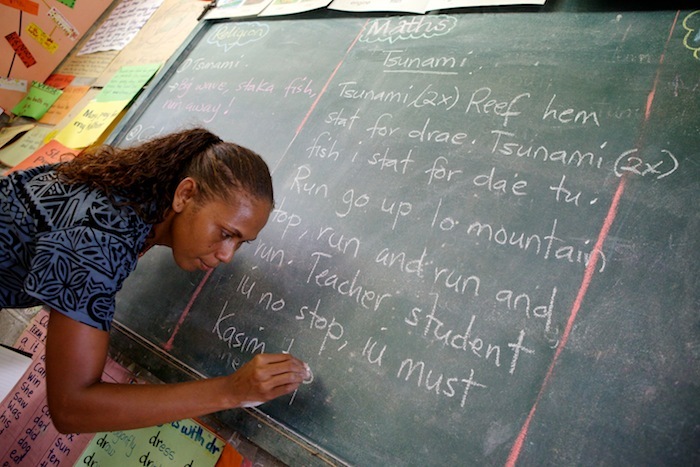 Most of the teachers are volunteers from the local community. Noor said she liked to draw pictures of flowers and birds. At the time there was no formal education system set up in the camps and Mohammed said he was afraid of missing out on his education but enjoyed going to the centre anyway and wanted to become teacher. 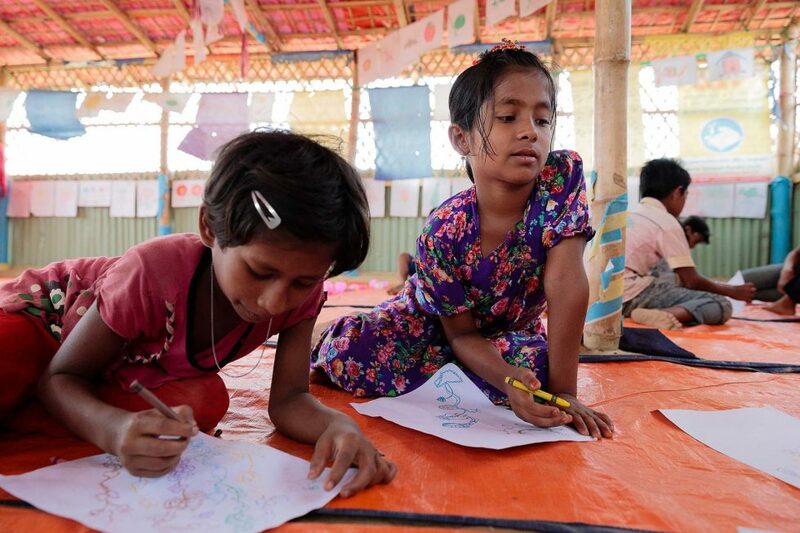 Noor (10) (right) is seen drawing with friends at a Women and Child Friendly Space in Jamtoli Rohingya refugee camp in Cox’s Bazar. Noor witnessed her parents and youngest brother killed whilst fleeing into Bangladesh. 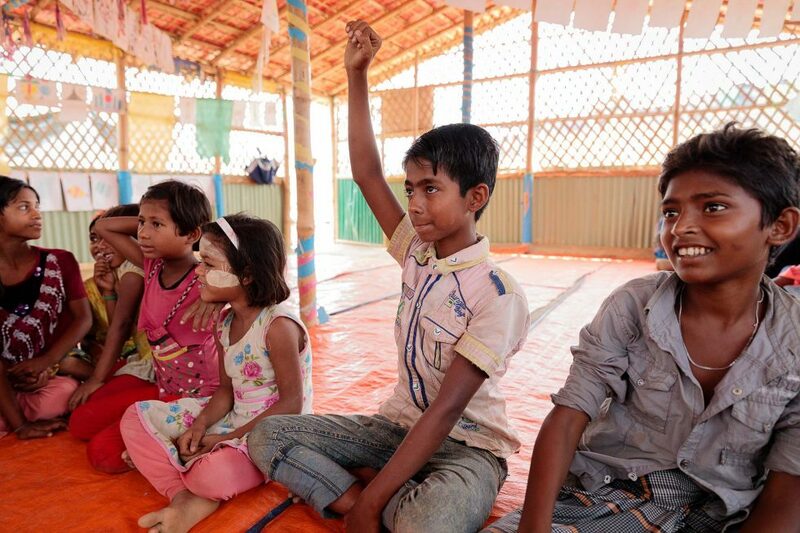 Mohammed (12) (centre) joins in learning with other children at a Women and Child Friendly Space in Jamtoli Rohingya refugee camp in Cox’s Bazaar. 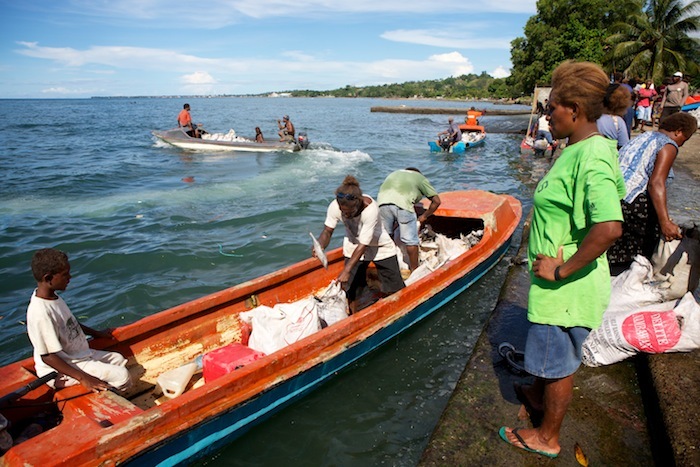 The need for basics such as food, water and medical care remain critical. 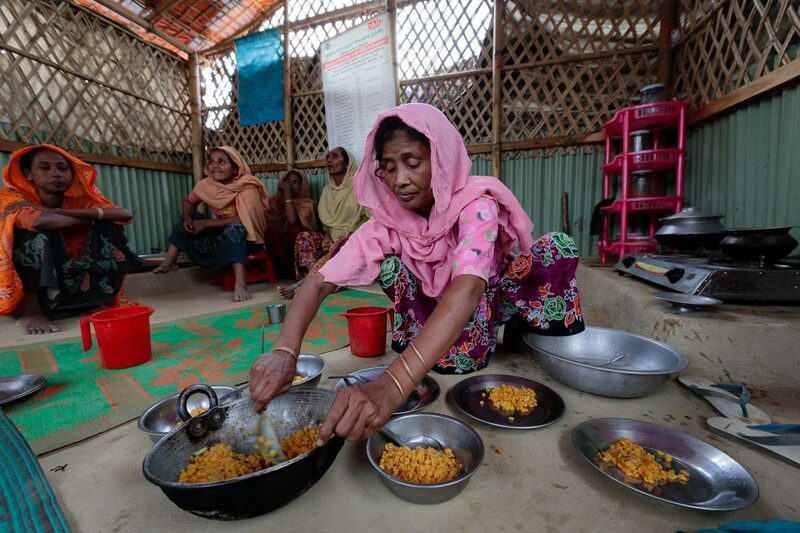 Malnutrition is a major concern and close to emergency levels in the camps. Children line up to be seen at a satellite medical clinic in Jamtoli Rohingya refugee camp in Cox’s Bazar. 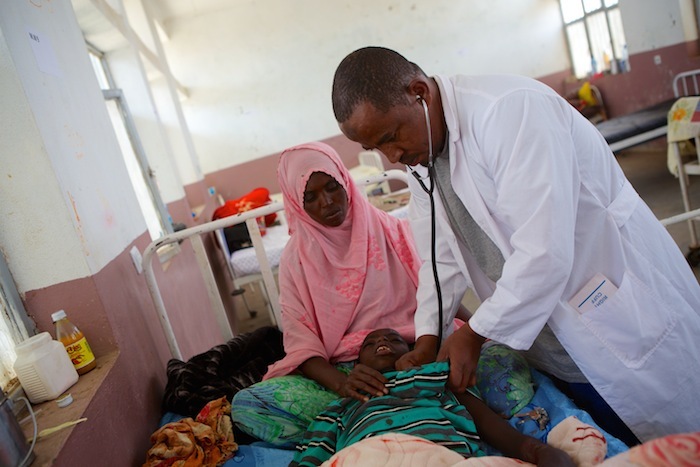 Between the main health centre and five satellite clinics DAM sees between 1200 to 1500 patients a day. Whilst interviewing Dr Hassan, one of the volunteer doctors from Dhaka working for Act for Peace partner DAM, Farida arrived at the clinic with her sons Min (7) and Yasin (11). 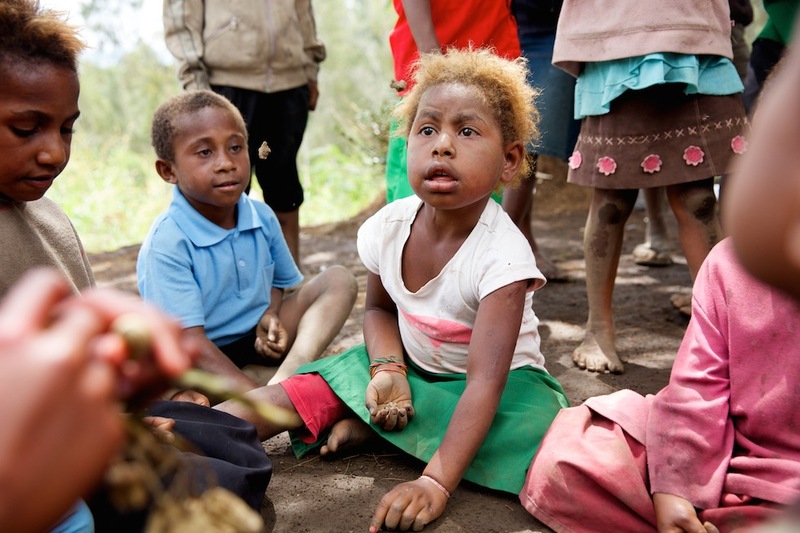 They were diagnosed with a skin disorder related to malnutrition. Farida looks on as her son Min (7) is treated by Dr Hassan for a skin disorder caused by malnutrition at a health centre in Jamtoli Rohingya refugee camp. Farida told us her husband, who had been imprisoned and tortured, fled Burma after the army burnt down their home and three of their children died in the fire. It took them fifteen days to reach Jamtoli and they now live with their seven remaining children in the camp. Dr Hassan from (DAM) looks at a skin disorder on the arms of Min (7) caused by malnutrition at a health centre in Jamtoli Rohingya refugee camp in Cox’s Bazar. Dr Hassan from (DAM) looks at a skin disorder on the arms of Yasin (11) and his brother Min (7) caused by malnutrition at a health centre in Jamtoli Rohingya refugee camp in Cox’s Bazar. Malnutrition in the camps is a major concern. 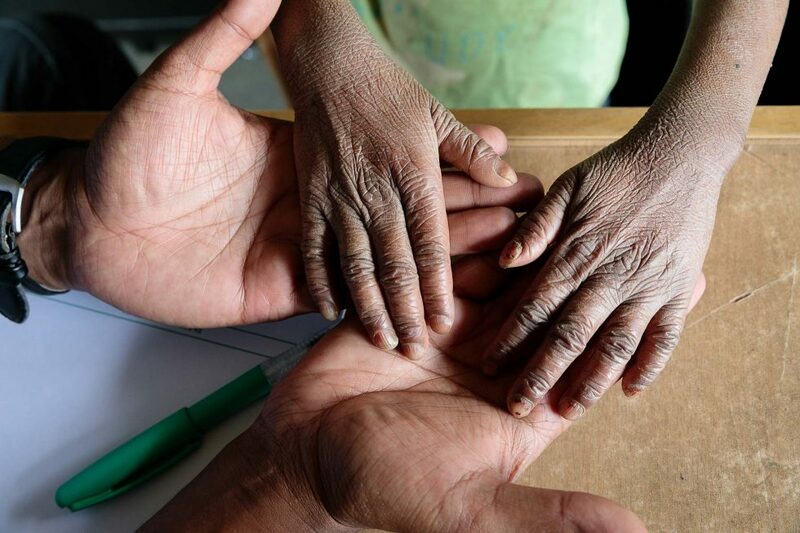 They were prescribed treatment for the skin disorder and referred to a specialist malnutrition clinic. Having fled without any possessions, at least 80% of the new arrivals are entirely dependent on humanitarian aid for survival so distributions of food and non food items are carried out almost every day. 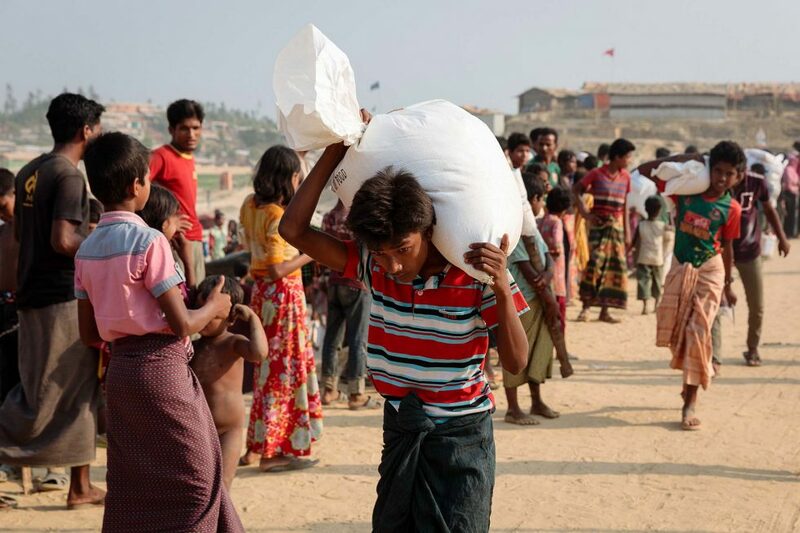 Rice and other items are distributed by aid agencies in Jamtoli Rohingya refugee camp in Cox’s Bazar. Women collect non food items at a distribution centre in Jamtoli Rohingya refugee camp in Cox’s Bazar. Over 58% of the refugees are women and children so the risk of gender based violence is high. One of the greatest risks to women and children are when they have to walk miles looking for firewood for cooking. Community Kitchens have been set up around the camp offering safe, clean, gas provided cooking spaces, but they also function as a place for women to meet and share their stories which helps with their psychosocial well-being. 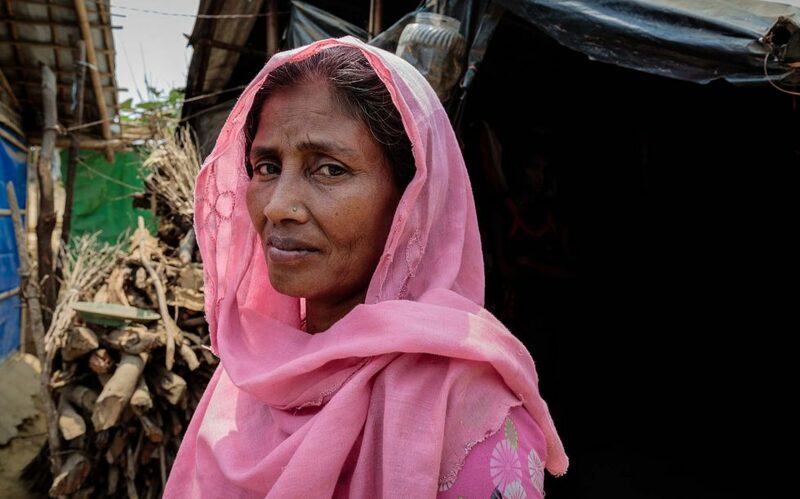 Jamila (40) pictured outside her shelter in Jamtoli Rohingya refugee camp in Cox’s Bazaar. 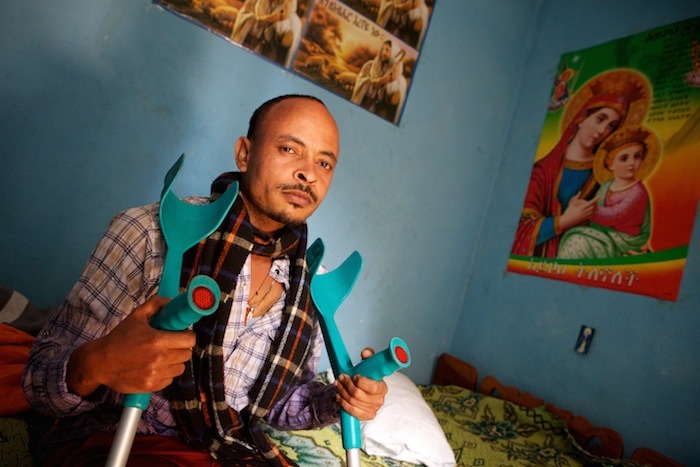 Jamila suffers from depression after her son, brother and nephew were shot by the Burmese Army. Jamila (40) uses a kitchen next to her shelter where she lives with her husband, five sons and two daughters. Jamila suffers from depression after her eldest son, brother and nephew were shot by the Burmese Army. She says when she is in the Community Kitchen with her friends her depression is lifted but when she is alone it returns. 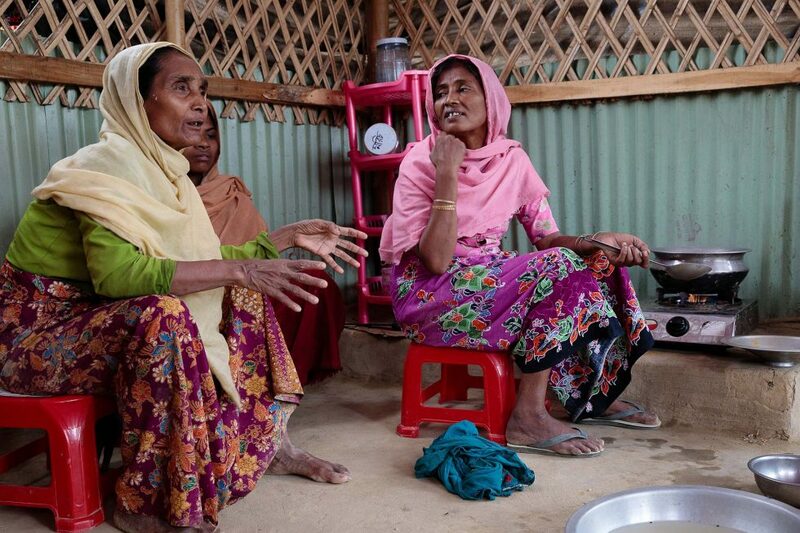 Jamila (40) (right) talks with friends whilst cooking lentils for her family in a Community Kitchen in Jamtoli Rohingya refugee camp in Cox’s Bazar. Jamila says when she is in the Community Kitchen with her friends her depression is lifted but when she is alone it returns. 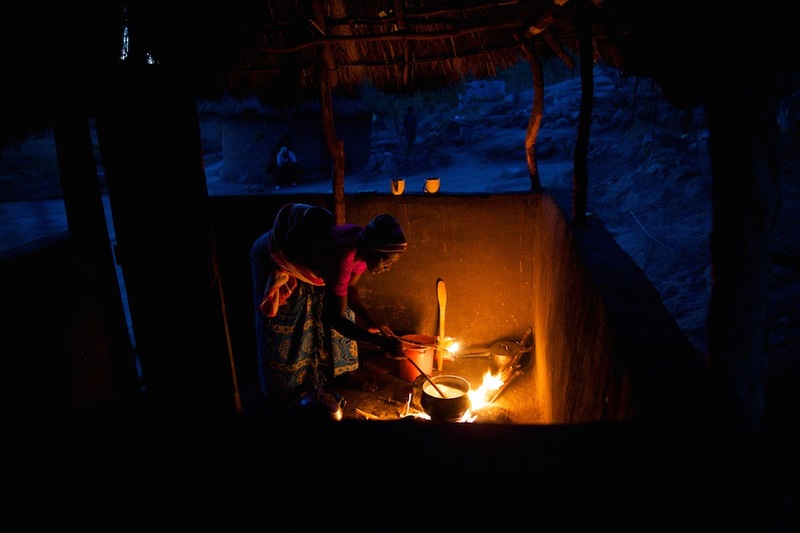 The kitchens also reduce environmental degradation caused by deforestation and without them, families have to cook in their tents creating smoke and fire hazards. Jamila (40) (centre) serves up lentils she has just cooked in a Community Kitchen in Jamtoli Rohingya refugee camp in Cox’s Bazar. 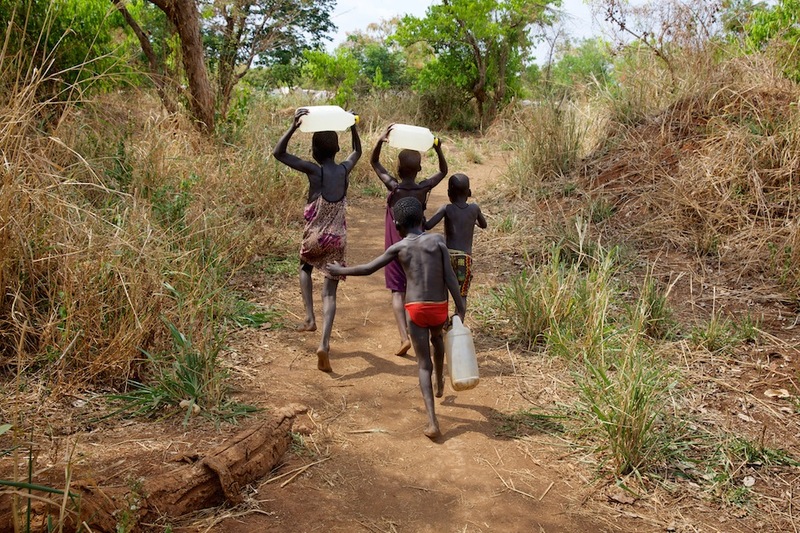 In the hot and humid conditions, access to fresh clean drinking water becomes a priority. 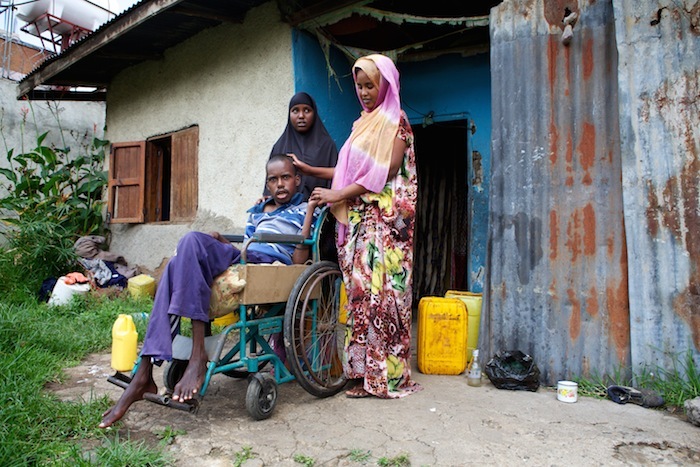 Whilst there are water pumps installed in the camp, some families still face challengers in accessing them. 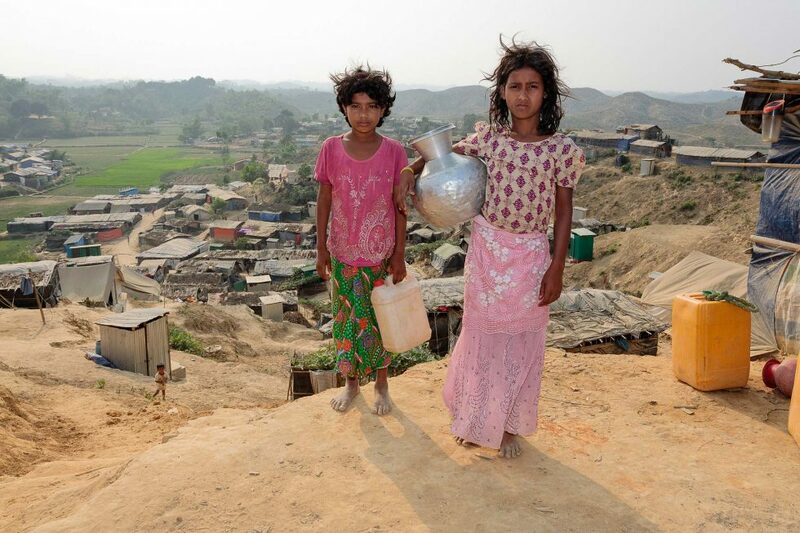 Razia (10) and Sufaira (13) who are friends are seen collecting water in Jamtoli Rohingya refugee camp in Cox’s Bazar. Sufaira (13) and her friend Razia (10) have to make the difficult, tiring and dangerous journey down and up a steep hill between three and ten times a day to collect water. Their families arrived later at the camp and the only space they could find to build a shelter was on the wind swept brow of a hill. Razia (10) and Sufaira (13) are pictured outside their home after collecting water from a water pump at the bottom of the hill in Jamtoli Rohingya refugee camp in Cox’s Bazar. 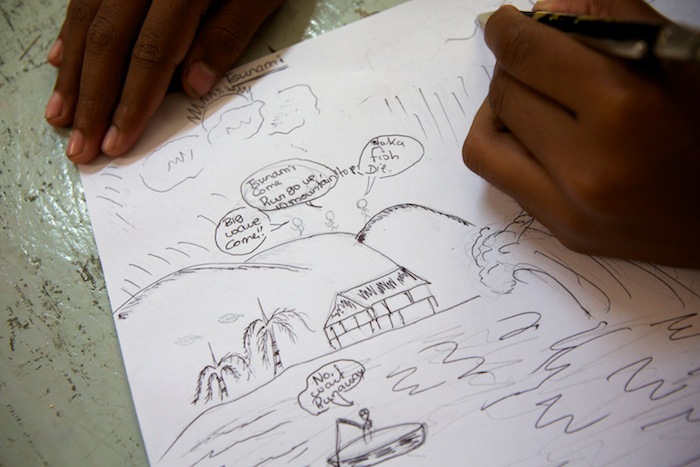 Sufaira (13) said, ‘It’s a very painful journey and we have fallen many times. My mother broken her arm collecting water. 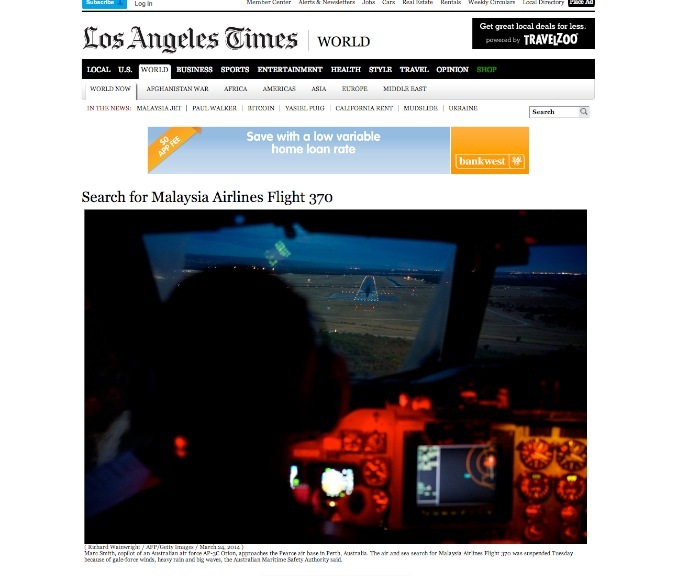 “ They are hoping a water pump can be installed nearer to their home. The flow of refugees from Myanmar to Bangladesh has slowed but violence and persecution in Rakhine state continues. 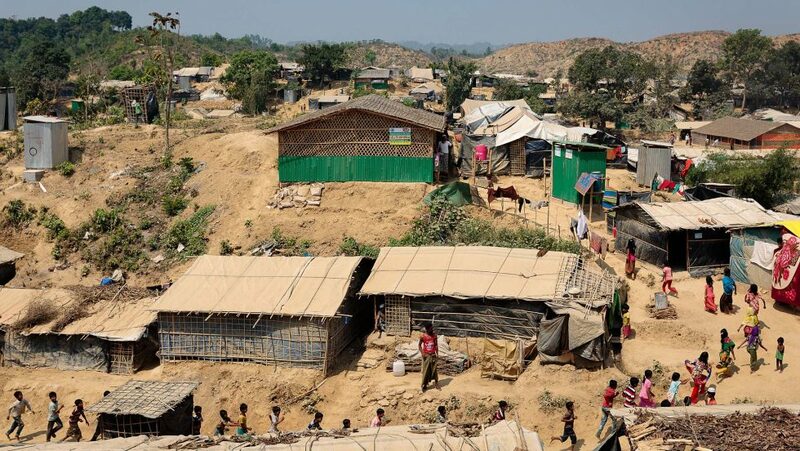 In November 2018 there was an attempt to start repatriation of refugees back to Myanmar but few, if anyone, volunteered and the plans were halted. 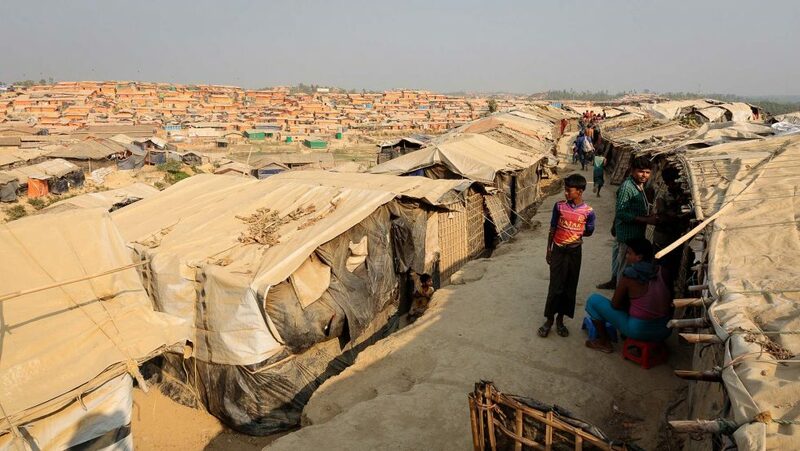 A general view of Jamtoli Rohingya refugee camp in Cox’s Bazar. The need to provide the basics for survival in the camps is essential. Below is a short appeal video that we shot and donations can be made here. 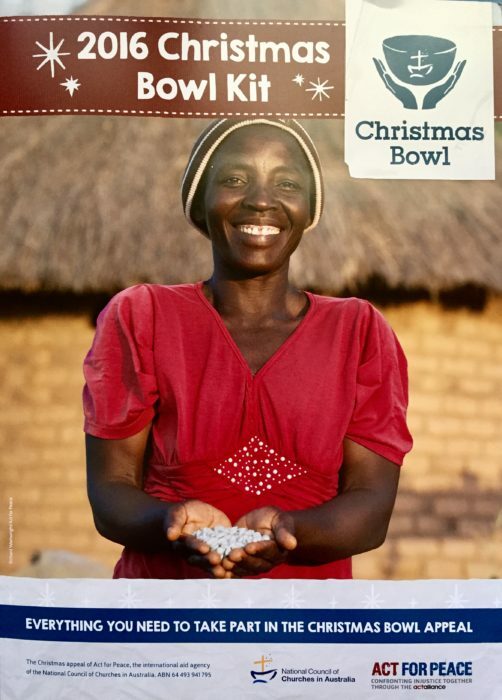 A farming project in Zimbabwe was chosen as this years focus for the Act for Peace Christmas Bowl appeal with Jessina and her amazing family showing how it’s done. Below are some images and video from the two trips taken during different seasons. If you want to learn more or donate please click on Christmas Bowl 2016. Jessina has been a member of the Conservation Farming program for four years and the family is now considered food secure. Before joining the program, the land they farmed didn’t produce enough maize to feed the family or send their children to school. 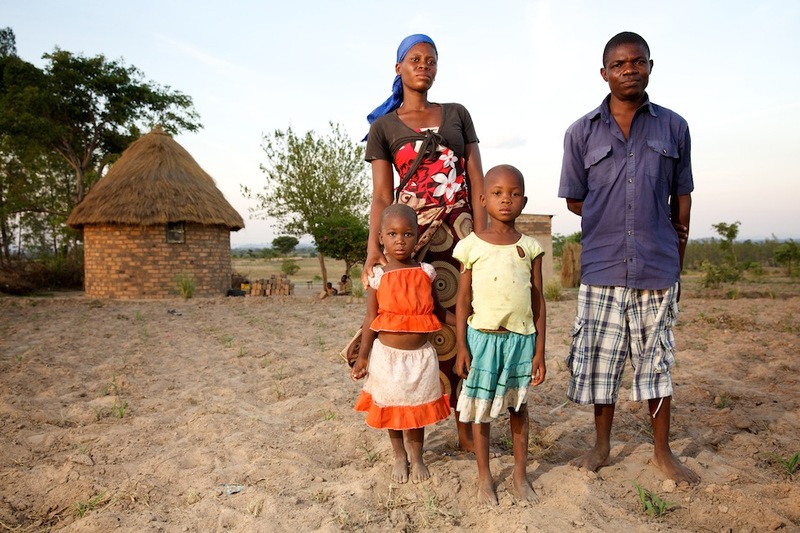 With a changing climate, prolonged drought and irregular rainfall patterns, the family was becoming increasingly vulnerable. 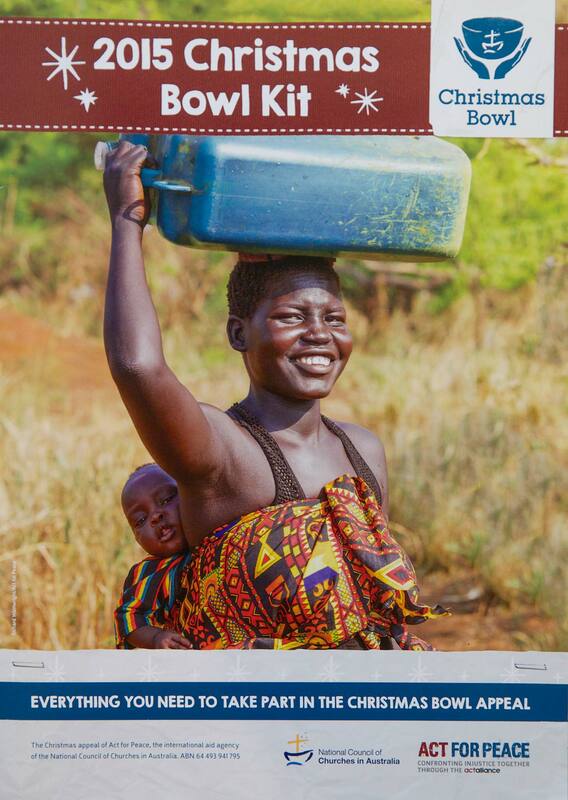 Jessina on the front of the campaign brochure. Jessina was introduced to the program run by local partners Christian Care and after the first year she had produced enough food for her family and was able to sell the surplus maize and buy a goat for breeding. In the second year she was able to buy her children new clothes and pay school fees. 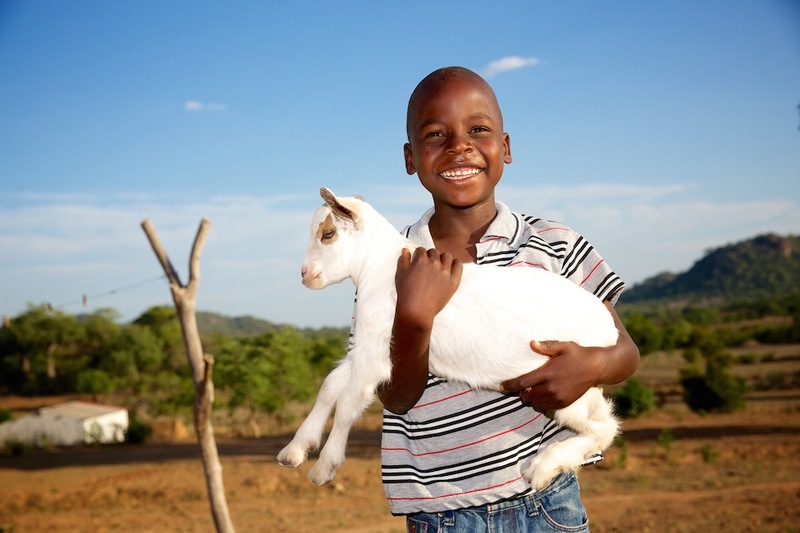 “I’m now in my third year, and I have many goats, turkeys, guinea fowl and chickens. “ Jessina said. 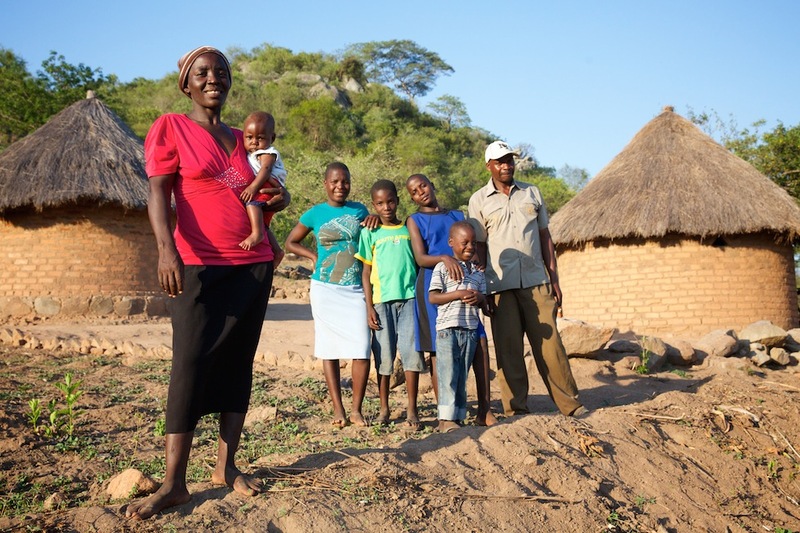 Jesina standing with her family outside their home in Zaka district, Zimbabwe. 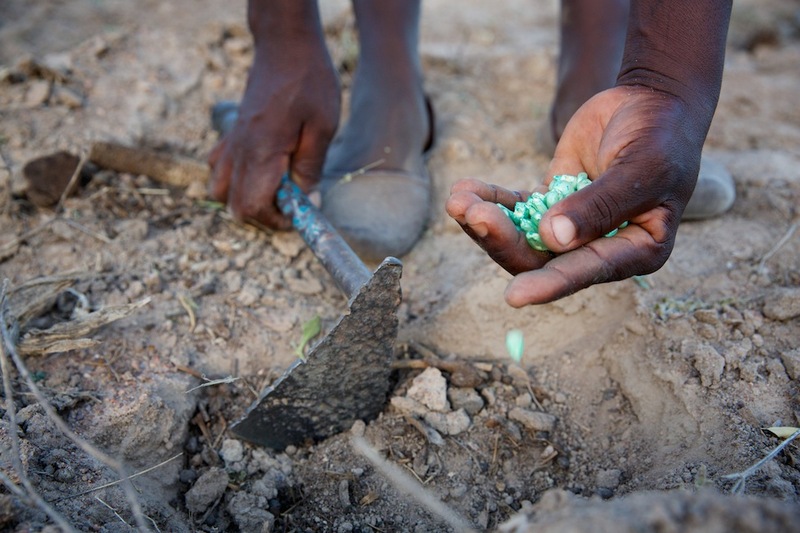 Christian Care have run the program since 2004 and teach farmers techniques such as using year round mulching to lock in moisture and planting at the correct time so that a crop will be possible even in the driest conditions. 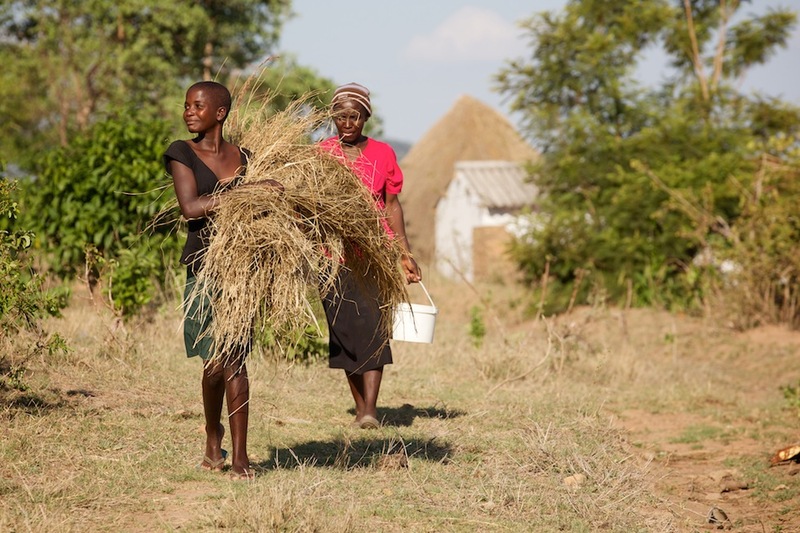 Apolonia helps her mother Jesina carry mulch for their newly planted maize fields at their home in Zaka district, Zimbabwe. Zaka district where Jessina lives is experiencing an unusually long dry spell which has badly affected her first crop of this season. 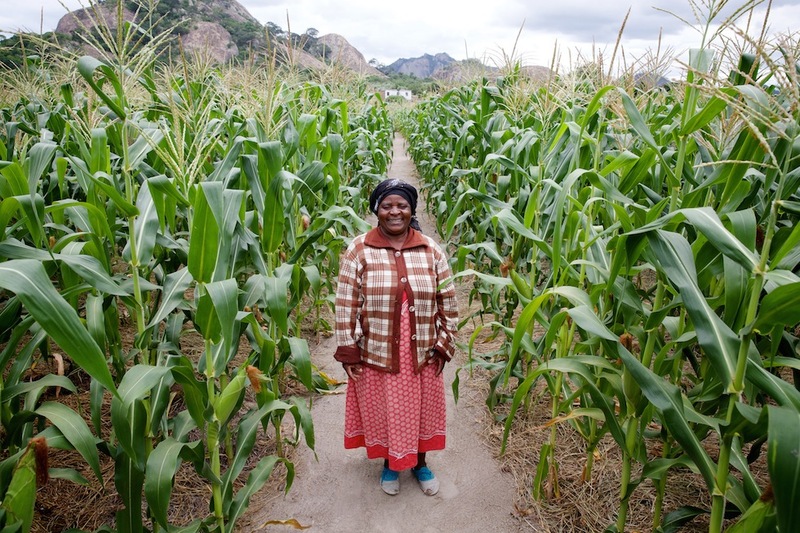 Although she is concerned about not being able to produce a big crop this year, she now has enough maize in reserve and the ability to sell some livestock to pay for food and school fees. Below is a video I shot on the first trip and some more images. Mitch also shot a beautiful video on the second trip which can be seen here. Joyce Chauke (57), a conservation farmer inspects her field of maize in Chitanga Village in Mwenezi District, south east Zimbabwe. 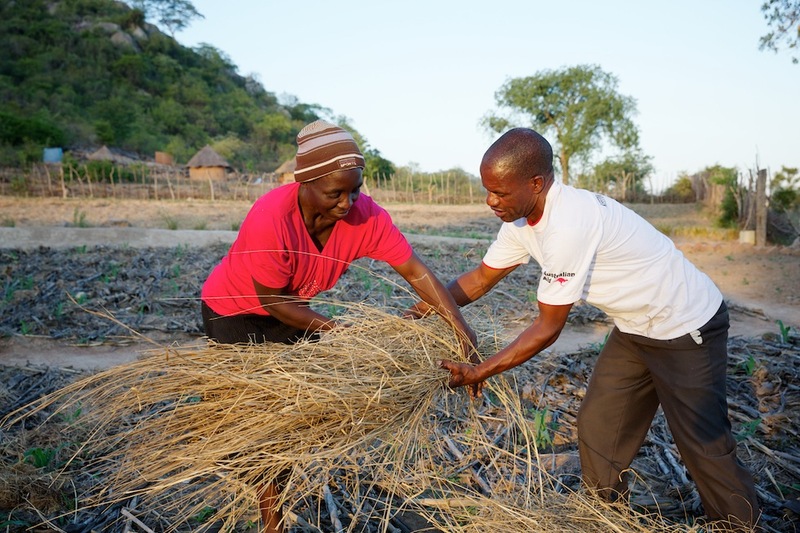 Family members of Aaron Runesu (54), a lead farmer on the Christian Care conservation farming program helping carry banana grass cuttings used for mulching and feeding livestock in Mapume Cluster in Chiredzi District, Zimbabwe. This year the region is experiencing a prolonged drought making conditions hard for the farmers. Aaron started on the farming program in 2009 and is one of the original farmers. His main crop is maize and some groundnuts. Marion Makusha (33) preparing breakfast for family members after a mornings work in their fields in Mapume Cluster in Chiredzi District, Zimbabwe. A view from a hill overlooking Jessina’s home with her house on the near left and the family fields on the right. 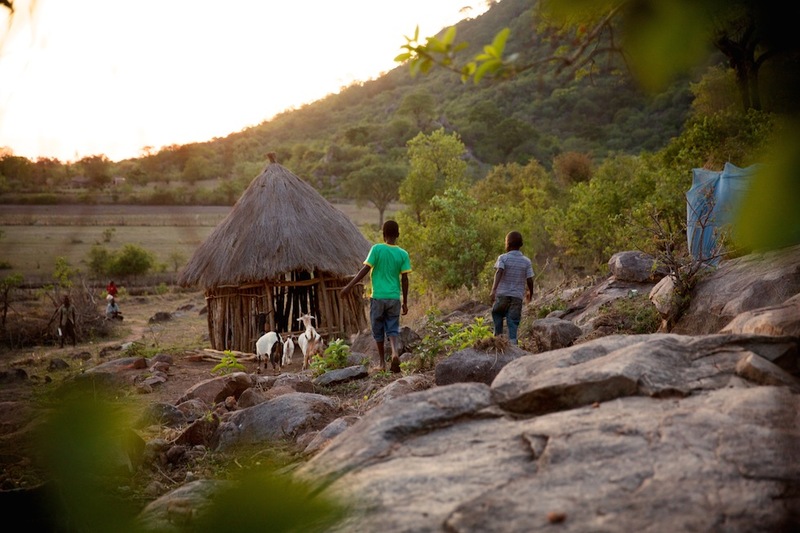 Christopher (11) and Stanley (6) herd goats near to their home. 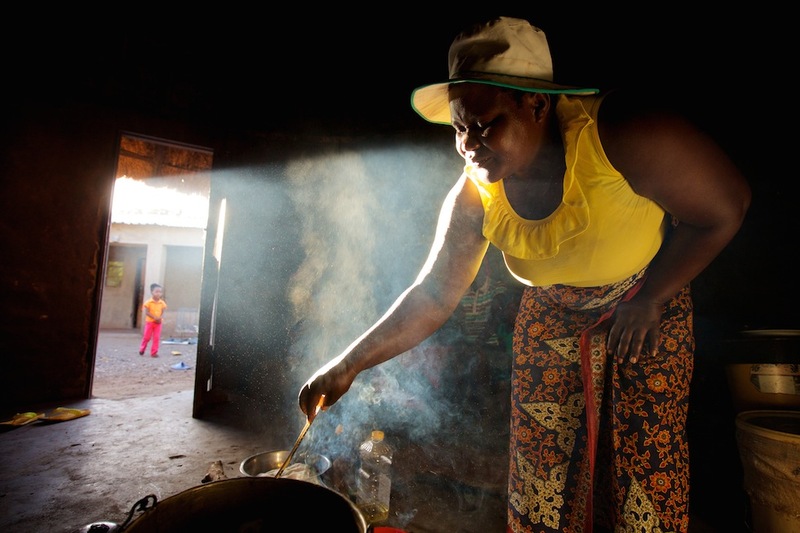 Jessina cooking a meal for her family at her home in Zaka district, Zimbabwe. Nyemba Beauty and her family are just about to start on the Conservation Farming program. 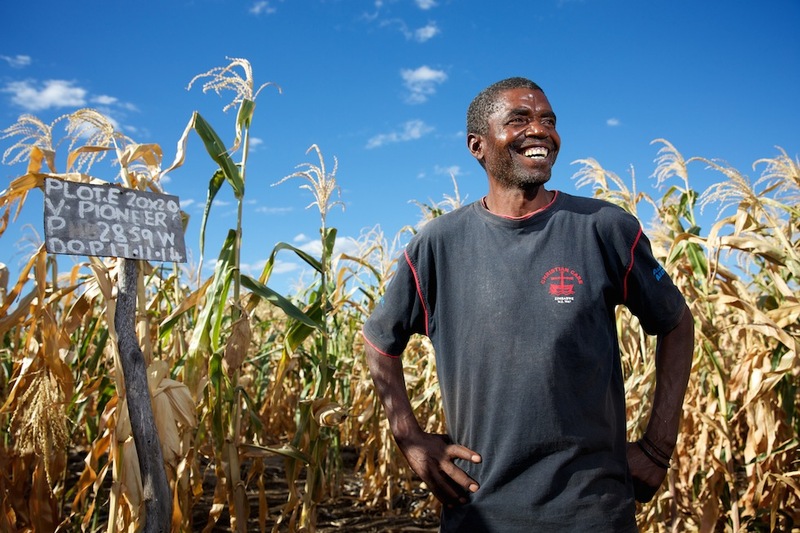 Currently their fields do not produce enough maize. Jessina planting maize seeds in her fields. 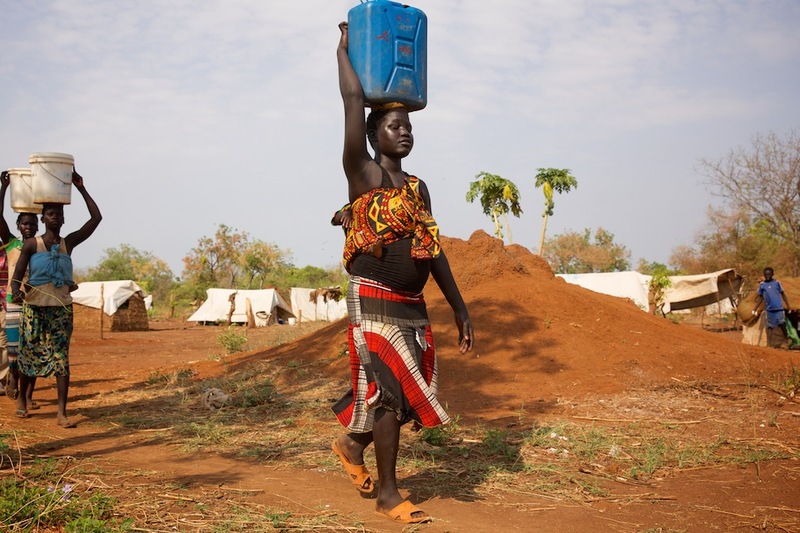 Apolonia (14) collecting water from a communal bore hole 2km from her home. 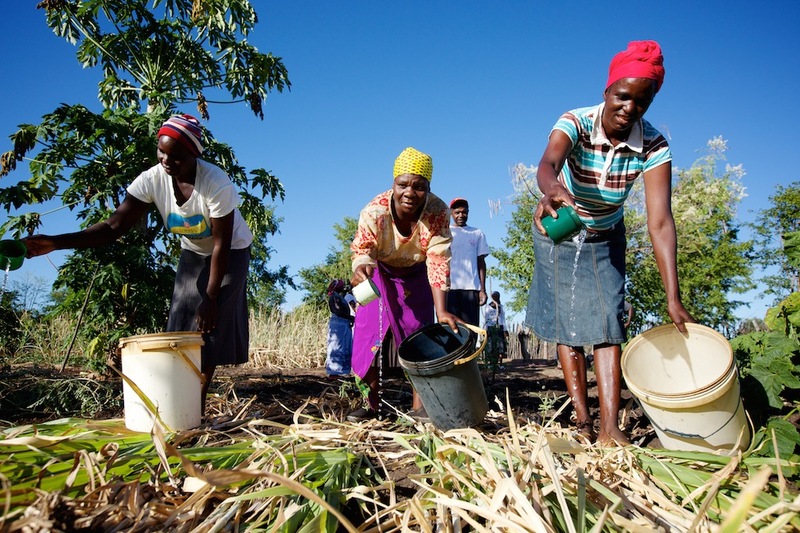 The water is for drinking and household use and it also provides moisture to the newly planted maize crops. 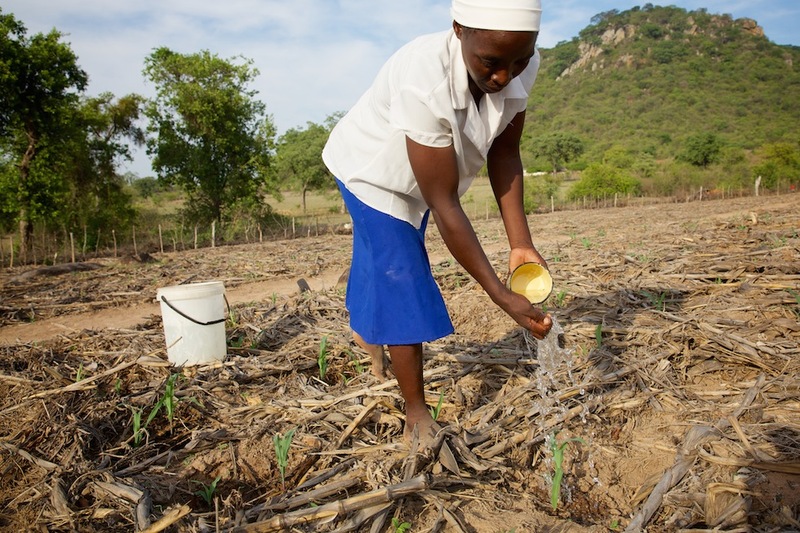 Jessina adding water to her newly planted maize crop. Desmond Makuni, from Christian Care demonstrating how important mulching is to stop rain run off to new farmers. Jessina is shown mulching techniques by Newton, a Project Assistant with Christian Care who has been her mentor for four years. Jessina proudly showing one of her turkeys. 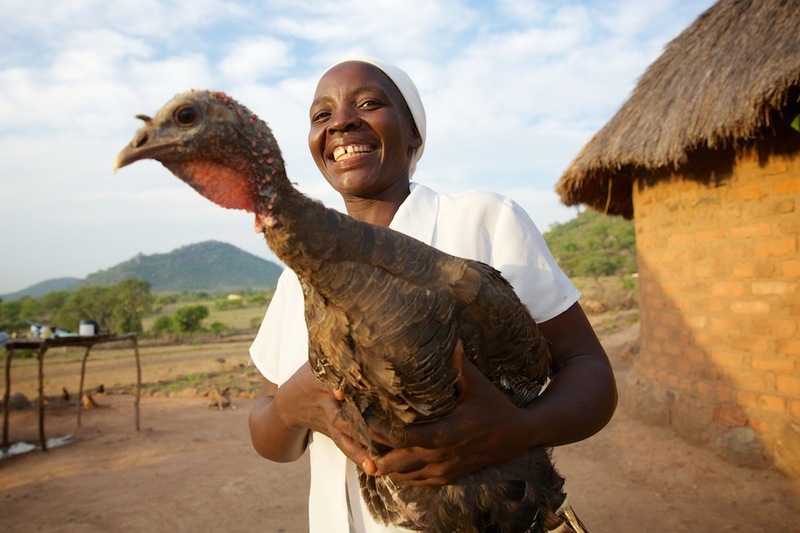 She was able to buy the turkeys for breeding after using conservation farming techniques which produced enough maize to feed the family and left enough to sell. 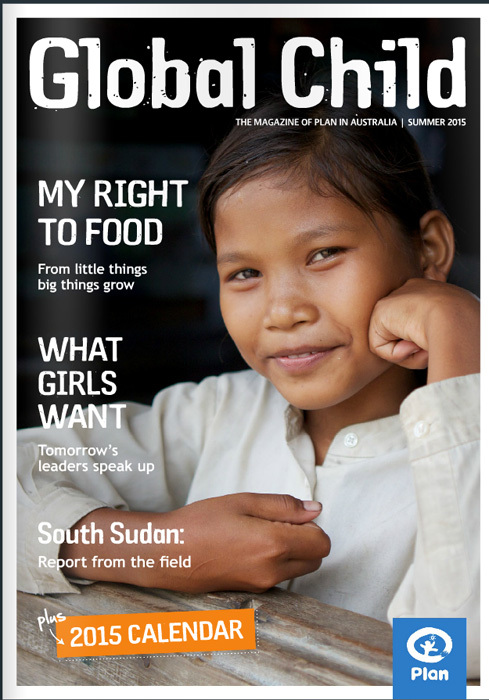 I’m catching up on some assignments I’ve completed over the past year, starting with a trip to Cambodia and Laos with Plan International Australia, so below are a selection of images highlighting the programs we visited. 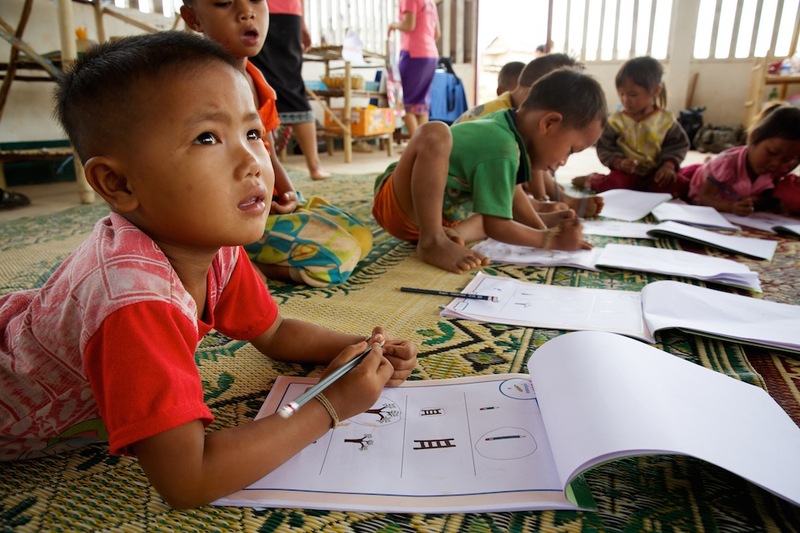 In Cambodia we were looking at the challengers children face with nutrition and accessing education. Whilst the country is rapidly developing, most visibly in the cities such as Phnom Penh, you don’t have to go far from the main roads to see how poverty and lack of employment opportunities are affecting the younger generation. 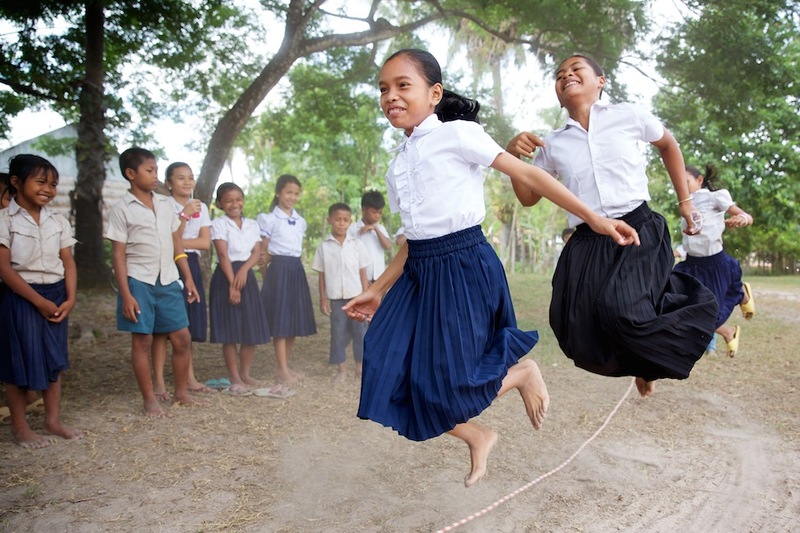 One girl we met was 13 year old Sokhat who lives in a small village in Siem Reap. Despite living close to Angkor Wat, now one of the worlds most popular tourist destinations, Siem Reap remains one of the poorest provinces in Cambodia. Malnutrition continues to be a major problem with most children showing signs of malnourishment and 45% have experienced stunted growth. 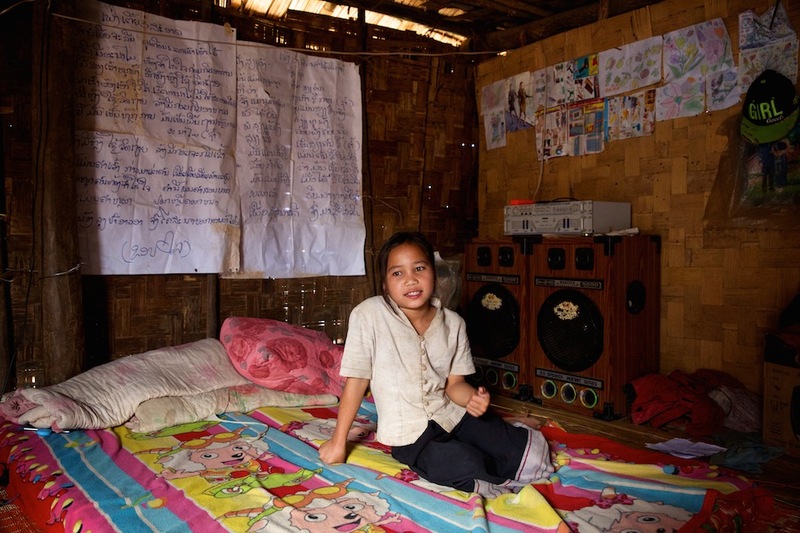 Sokhat (13) pictured outside her home in a village on the outskirts of Siem Reap province, Cambodia. 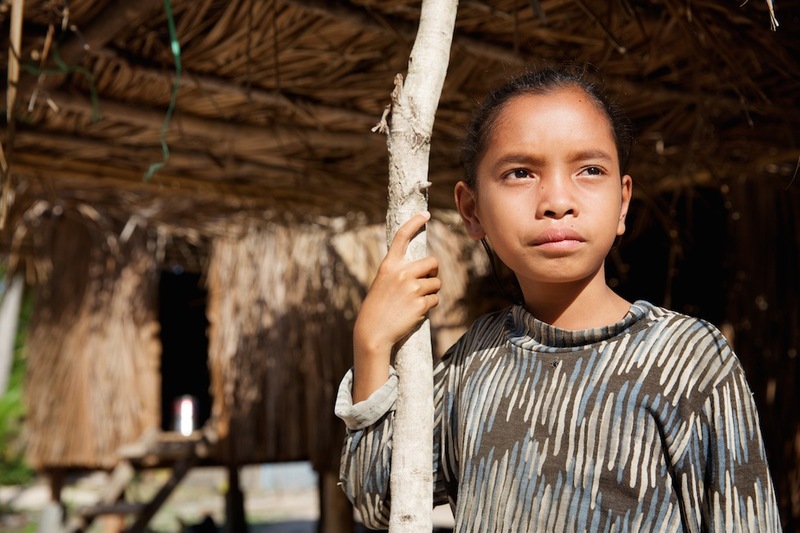 Sokhat lives with her mum, Mean Khon, (52) in a small hut without power or water. They try to survive on a limited income Khon earns after her husband died of complications from a wound he received during the war. Khon herself is a survivor of that dark period, showing us scars from a gunshot wound to her leg received during an attack on her village. (L) Sokhat (13) is pictured with her mother Mean Khon, (52) sitting outside their home in a village on the outskirts of Siem Reap province, Cambodia. Sokhat walks to school every day and along with her classmates, she receives a breakfast of fish, rice and beans as part of the Plan Australia supported school feeding program. It’s easy to understand how having a healthy, nutritious breakfast sets children up for the day with enough energy to learn and play. (C) Sokhat (13) waiting to be served a breakfast of rice and greens as part of the Plan Australia supported school feeding program at her primary school. (C) Sokhat enjoying a breakfast of rice and greens with classmates. Students during the first lesson of the day after eating their daily breakfast. (Front) Sokhat and friends skipping during their first break time of the day. Sokhat during an outdoor maths lesson. The family also receives a bag of rice and a tin of oil to take home. Without this program Sokhat wouldn’t be able to attend school and would have to work to help support herself and her mother. 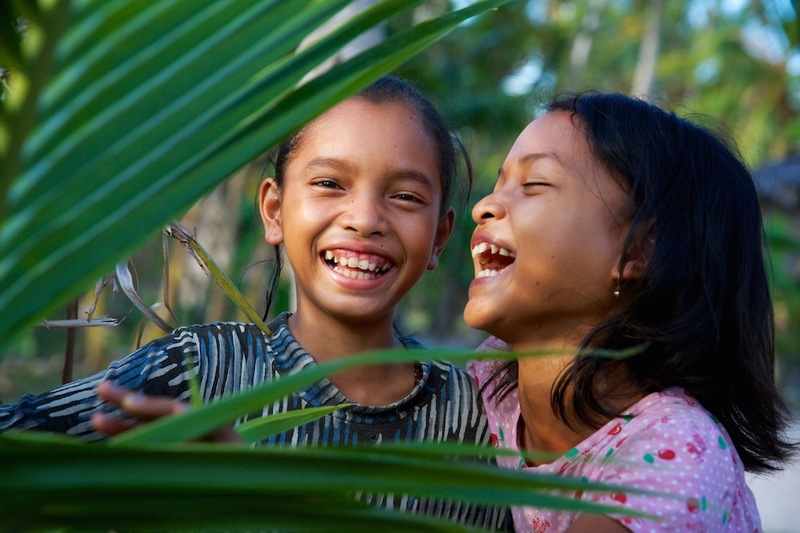 (L) Sokhat (13) and her friend Sreypin (11) play outside their home. 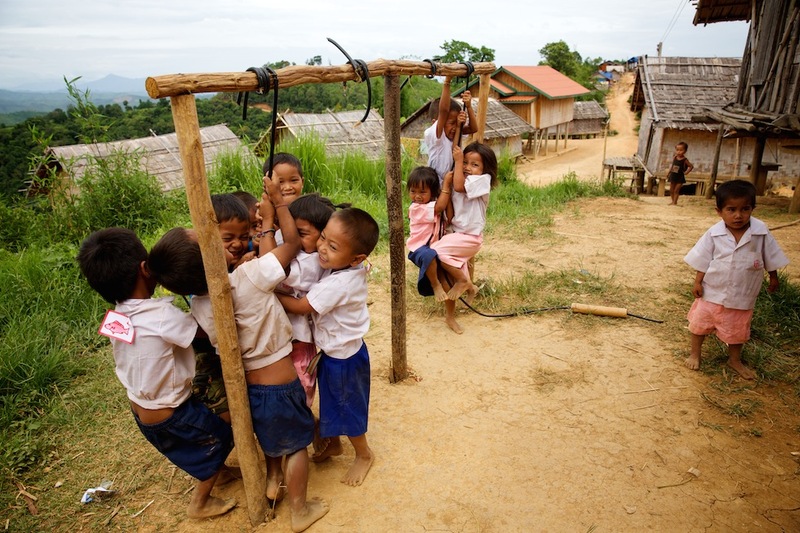 In Laos, early years education and hygiene were the focus of the programs. 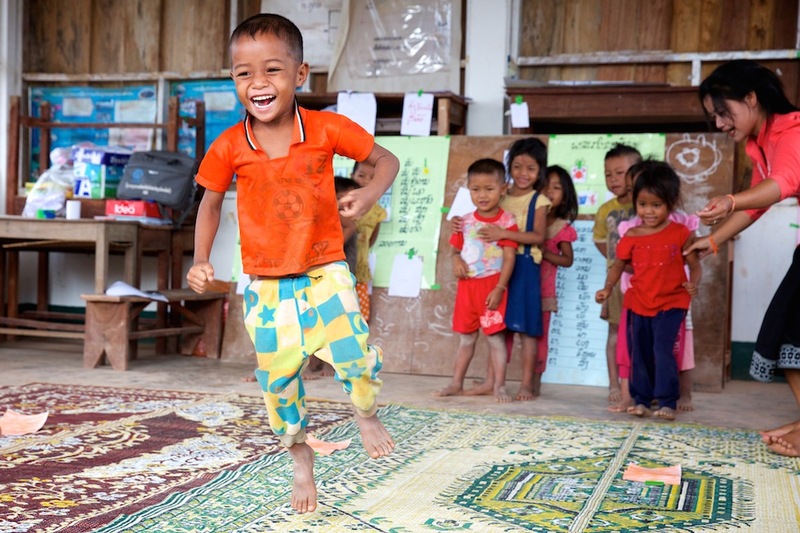 In the remote mountain district of Pha Oudom, many of the villagers are too small to run pre school classes which are considered essential for a child’s development. 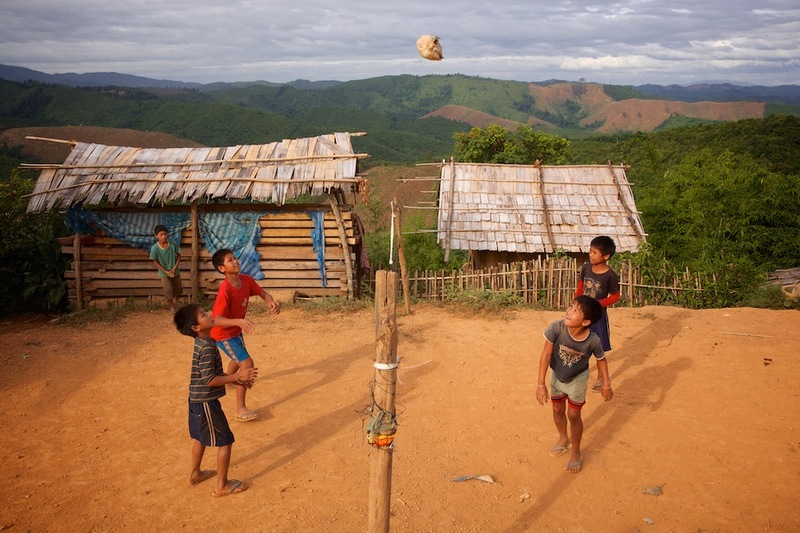 Children play volleyball with a makeshift ball in a remote mountainous, village in the Pha Oudom district of Laos. 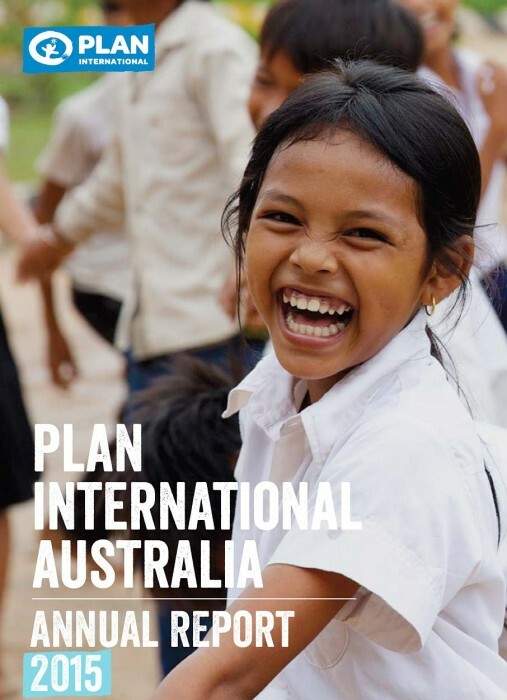 Plan Australia helped parents set up playgroups for three to four year olds as well as a summer school for older students where they play and learn together in a safe environment. Children participating in Plan’s summer school for children aged five and six. Children participating in Plan’s summer school. One of the important parts of their early education is learning essential hygiene practices like how to wash their hands and brush their teeth. 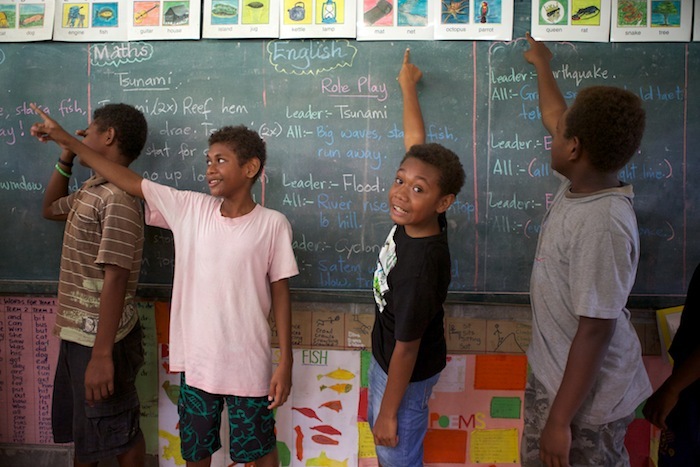 At school, they learn essential hygiene practices like how to wash their hands and brush their teeth. 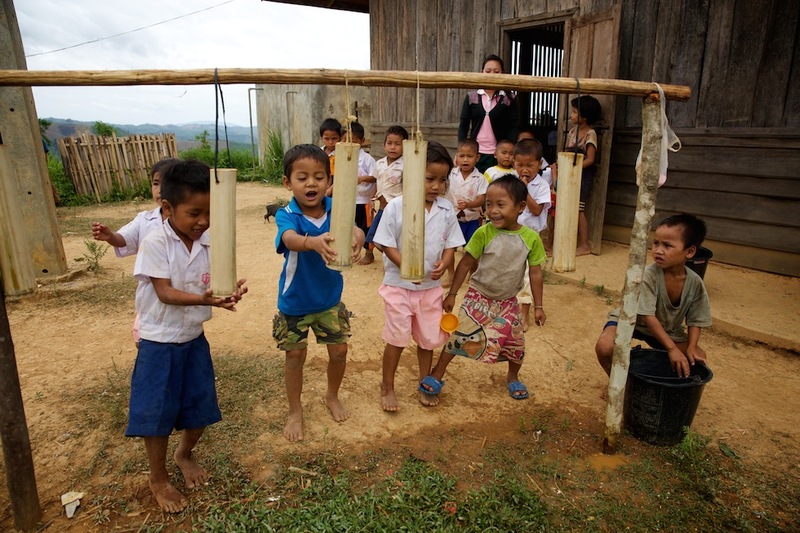 Children using bamboo taps to wash their hands. A young boy washes his hands using a bamboo tap. 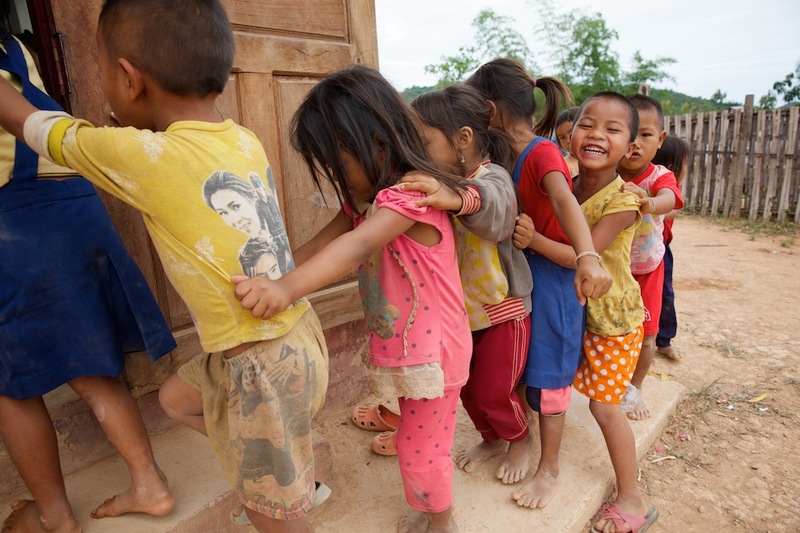 Children participating in Plan’s summer school for children aged five and six in a mountainous, remote village in the Pha Oudom district in Laos. Hygiene education lessons continue as the children get older. Vai (12), is a passionate supporter of hygiene education and even has the lyrics to a hygiene song she learnt at school hanging above her bed. Vai (12 ) washing her face at a water pump close to her home at sunrise. Vai (12) sitting on her bed in her small bamboo house .She is passionate about hygiene and has the lyrics of a hygiene song that she learnt at a Plan-supported school hanging above her bed. 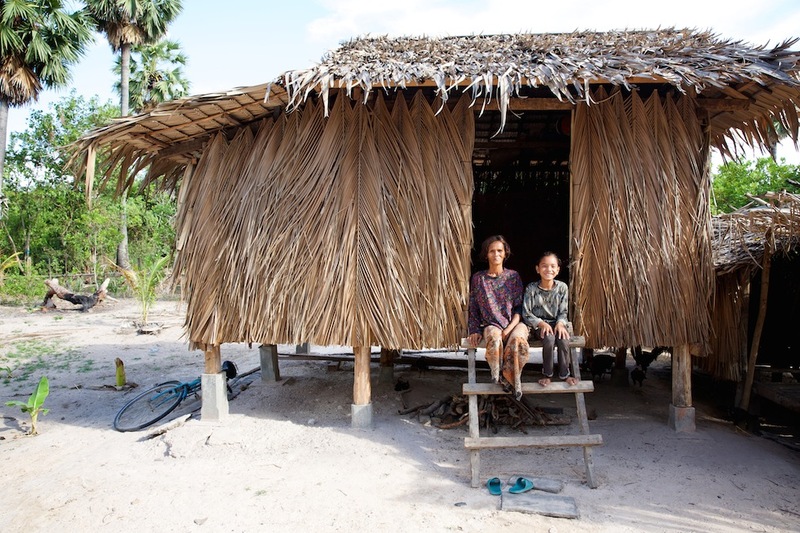 (R) Vai (12) outside her house with her mother Kow (37), father Juan (35) who are both rice farmers and her sisters. 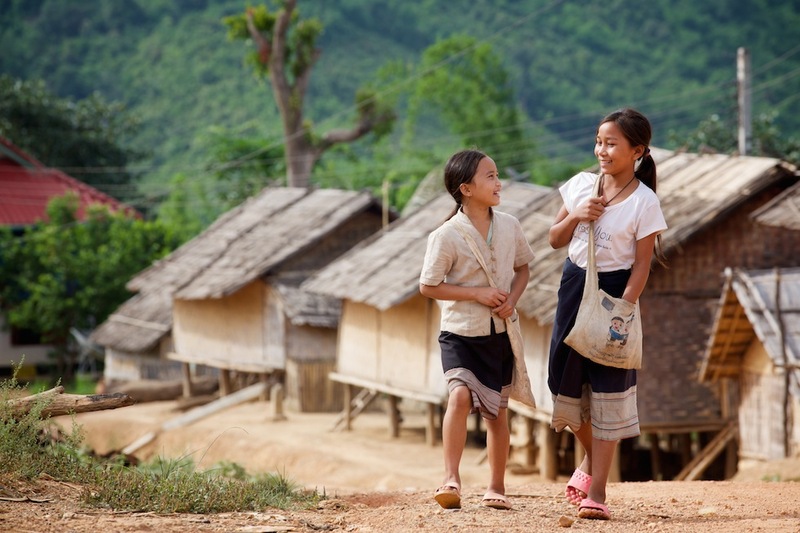 (L) Vai (12) walks to school with her best friend Mukatun (12) each with their Plan school bags. Below is a short promotional video made mostly during the trip to Cambodia and Laos. 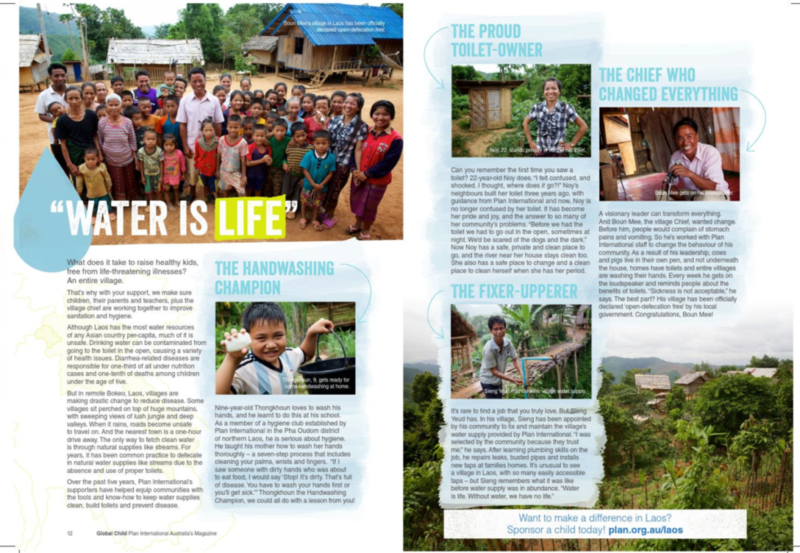 A page layout from another village in Laos in Global Child magazine. Images and film shot on assignment for Act for Peace Christmas Bowl appeal 2015. 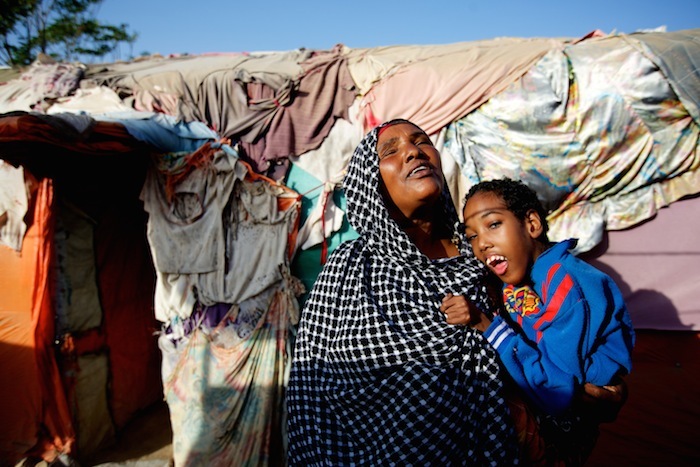 Ethiopia is now hosting more refugees than any other African country. 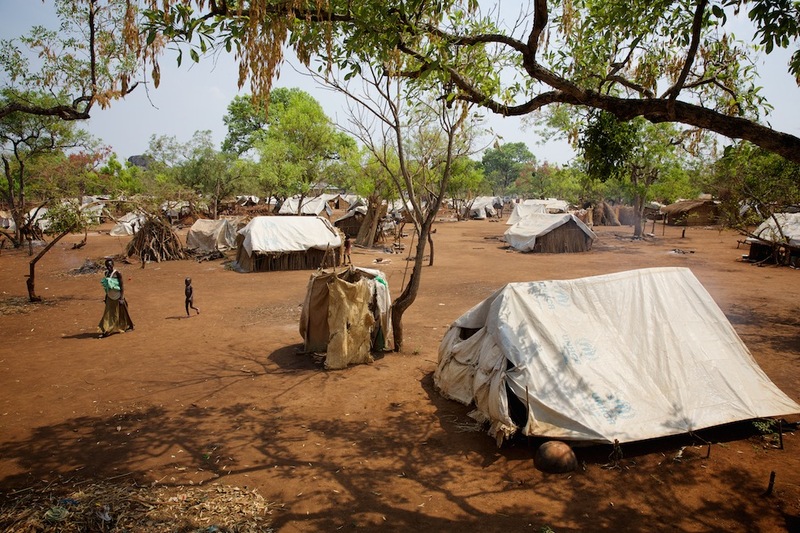 Many of those refugees, over 285,000 at present, have fled the civil war in South Sudan, which broke out in 2013. 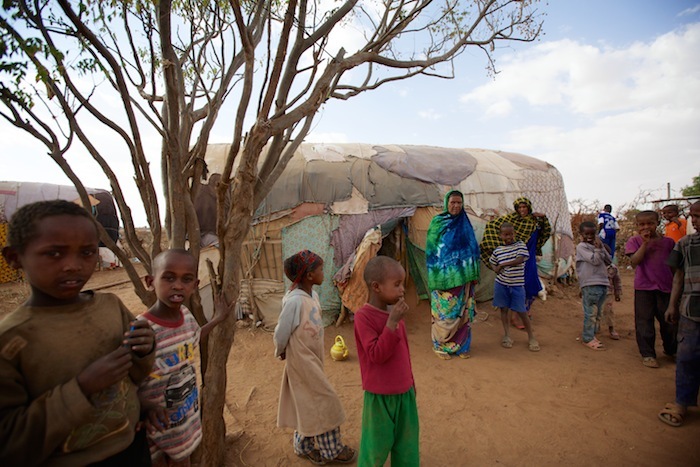 Most find shelter in the main camps run by UNHCR but a number of refugees from the less dominant tribes end up settling in Ethiopian host communities. 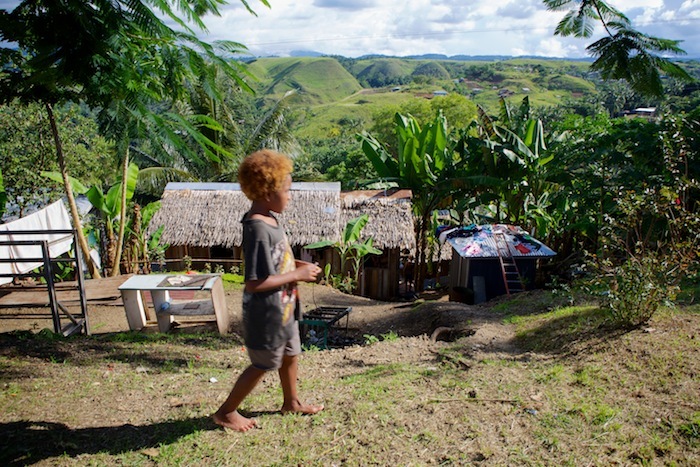 Whilst they benefit from having shared tribal connections and the same language, these communities often lack the resources and infrastructure available in the main camps and conditions can be extremely harsh. 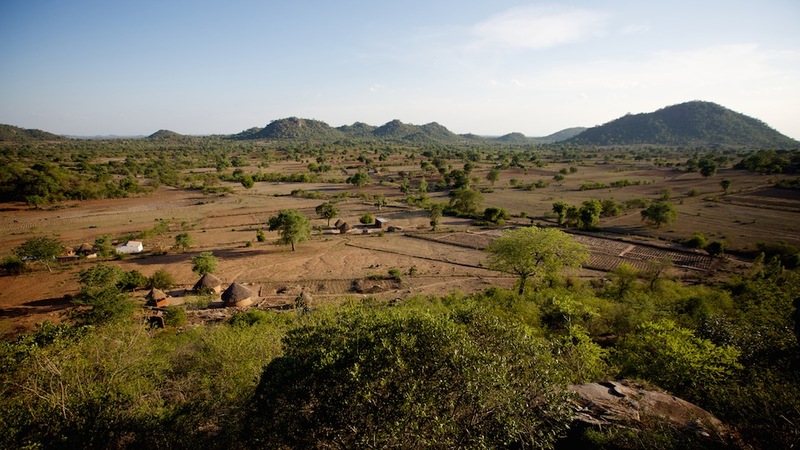 One such community we visited with Act for Peace was in Akula, now hosting over 1,600 people in the hot, dusty Gambella region of Western Ethiopia. 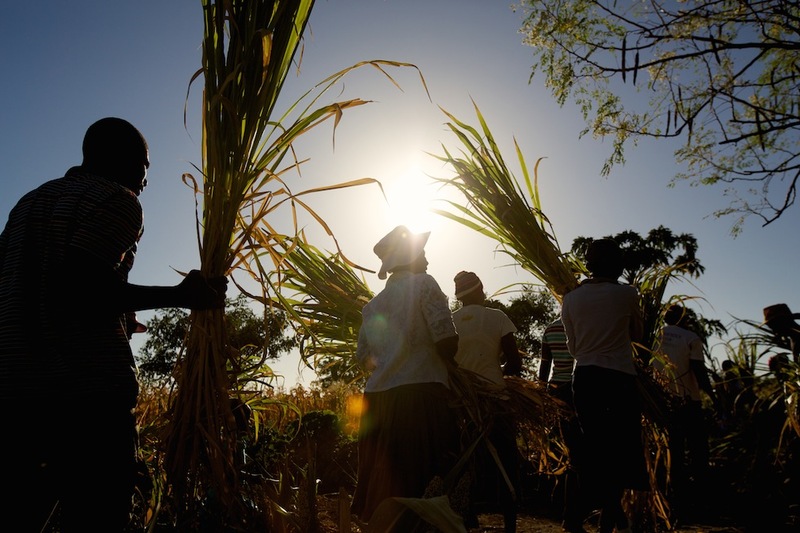 The farming community had fled to Ethiopia when rebels attacked their village in South Sudan. Everything was destroyed, all the houses were burnt down and there was no food left to eat. 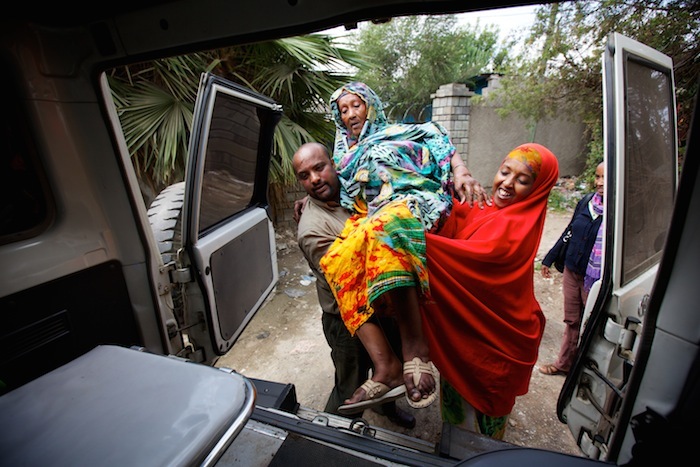 After a long trek they arrived in Ethiopia with nothing. 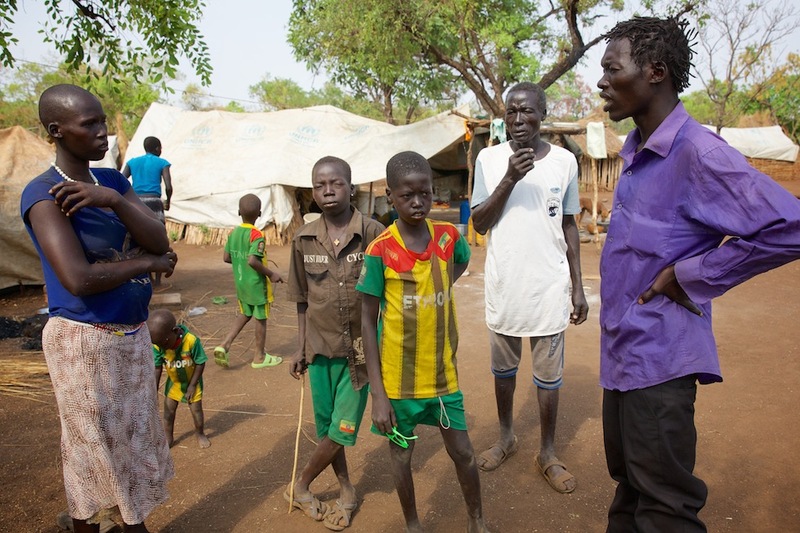 Akula community in Gambella that is hosting over 1,600 refugees from South Sudan. They have lived in these conditions for over a year. One year on and the greatest challengers they continue to face is access to water, sanitation and hygiene, which has had tragic consequences. When we visited, the community was in the middle of a Hepatitis E outbreak and five people had already died. 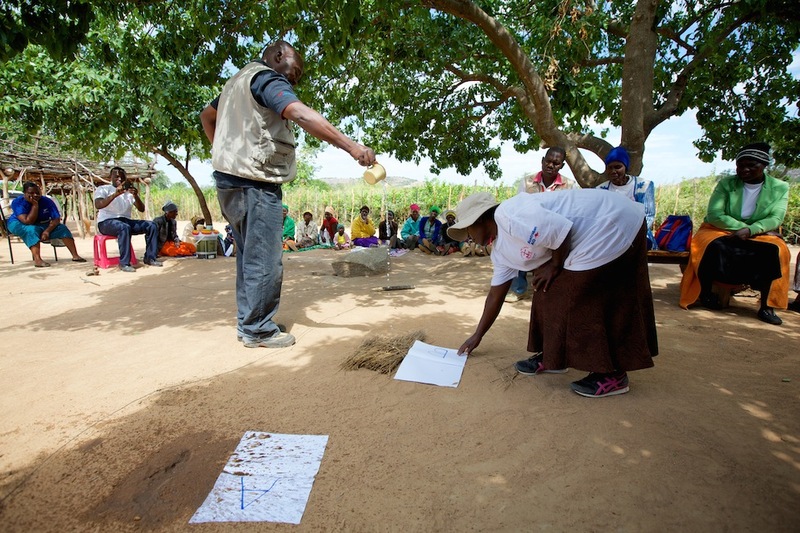 With just one working water point available, there wasn’t enough water for people to wash their hands and the two latrines built when they first arrived had already become unusable, so it was easy for the disease to take hold. 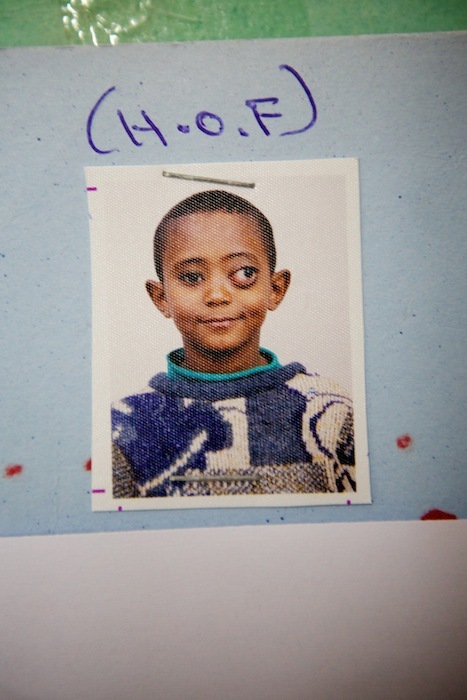 One young boy called John (8) was just starting to recover from what the community were calling “Yellow eyes disease’, named after the distinctive yellow eyes people get when infected. John looked exhausted and had just recently started leaving his bed. His anxious mother, Tuskur who had seen others die from the disease said she could only watch helplessly as he had grown weaker and weaker. 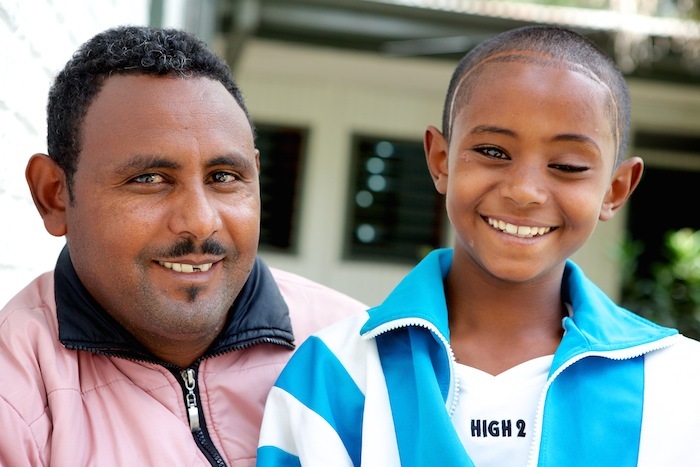 John (8) with distinctive yellow eyes, a symptom of contracting Hepatitis E. John had seen a doctor but there was no medicine available to treat the disease. He has been ill for over a week but he is slowly improving. John (8) (centre) who is recovering from Hepatitis E stands listlessly whilst his mother Tuskur talks with Chuol about hygiene and sanitation. Choul, himself a refugee from the same community used to work in WASH programs in south Sudan and now helps train his own community in Akula camp. After consultation with the refugees, Act for Peace and their local partner DICAC constructed the much needed latrines and fixed another water point. They also began distributing soap and trained people from their own community to teach families about hygiene and health. 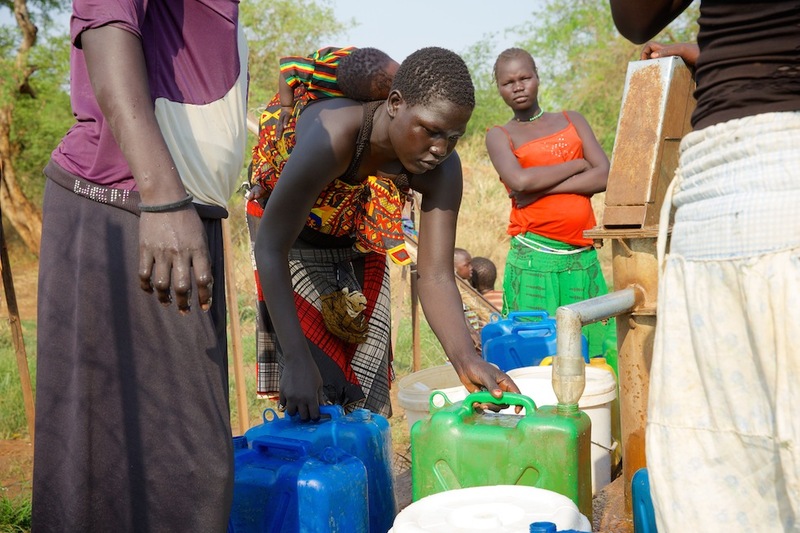 Kama (18) and her daughter Nyadak (1), refugees from South Sudan collect water from a water point in Akula community in Gambella. She now collects water 3 times a day for her family. Whilst there we also met Kama and her daughter Nyadak (1). An amazingly resilient young mother, Kama had to hide in bushes when soldiers attacked her home then flee across the border with her daughter. When she arrived she had nothing at all and ended up living in a makeshift shelter. She didn’t even have a bucket to collect water so had to borrow one from her neighbour. Kama was one of the first to receive a jerry can and soap during a distribution and is now able to care for her daughter. 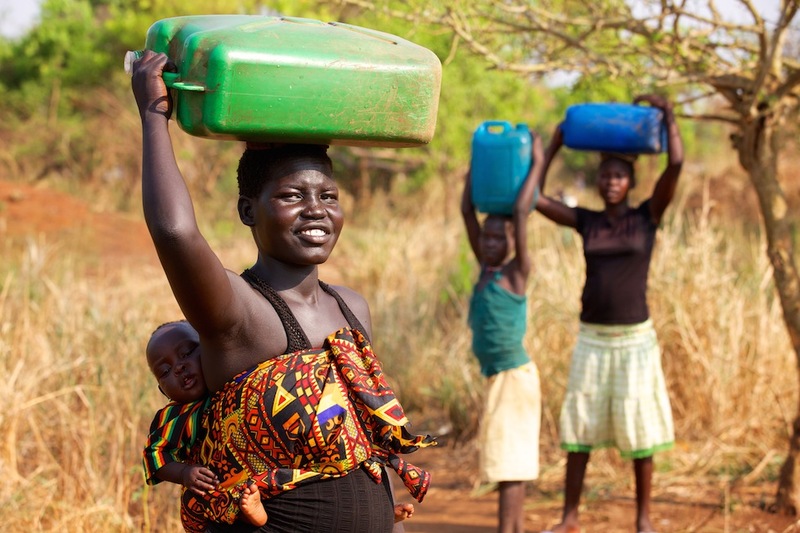 Kama (18) and her daughter Nyadak (1) collecting water from a water point in Akula. Kama (18) walking through Akula community after collecting water from a nearby water point. Kama arrived from South Sudan with nothing so had to borrow a jerrycan to collect water before the DICAC distribution. Kama outside in Akula community in Gambella that is hosting over 1,600 refugees from South Sudan. EOC DICAC have improved the hygiene and sanitation conditions by installing latrines and provided training and regular non food items such as soap and jerrycans. A recent follow up assessment reported back that since the introduction of the new latrines and water access, no one had fallen ill let alone died from Hepatitis E. Whilst the community undoubtedly still face many challengers and hope to return to south Sudan, the solution to giving people like Kama and John a safer, more dignified life in the camp was as simple as access to clean water, soap and toilets. 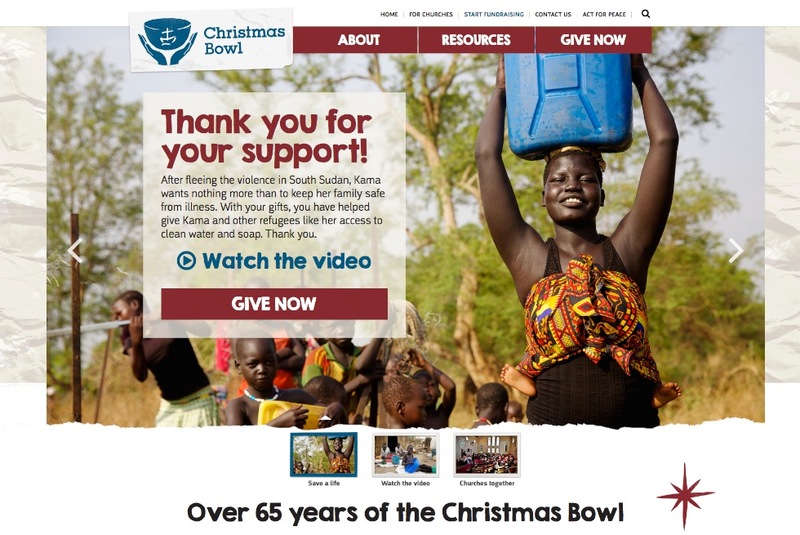 Akula camp and Kama became the main focus of the Act for Peace Christmas Bowl 2015 appeal. 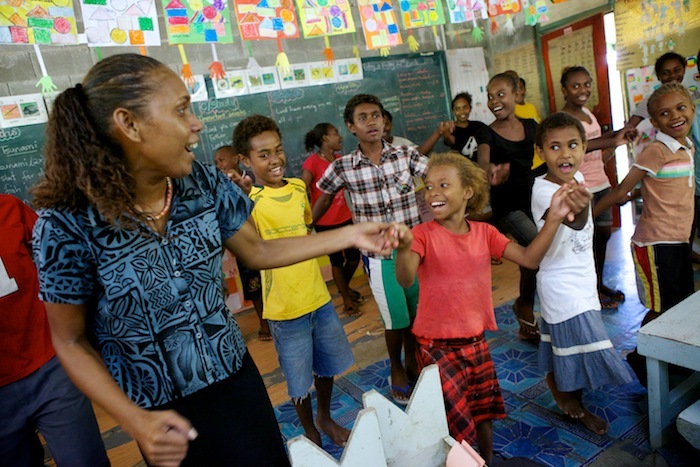 Below are some more images taken in Akula and other camps that Act for Peace and their partners work in. 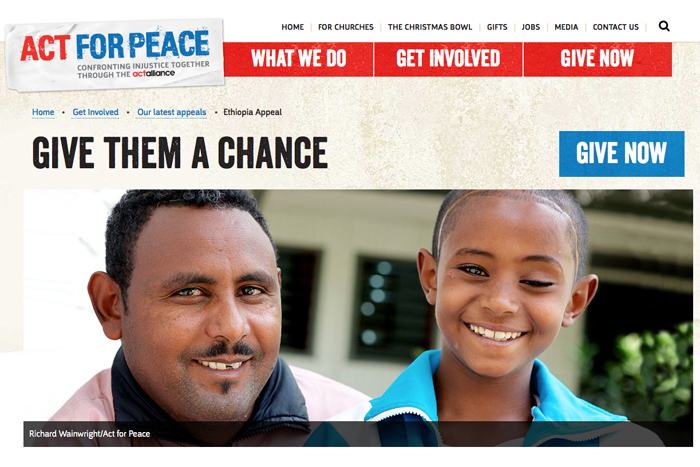 Front page appeal on the Act for Peace website featuring Kama. 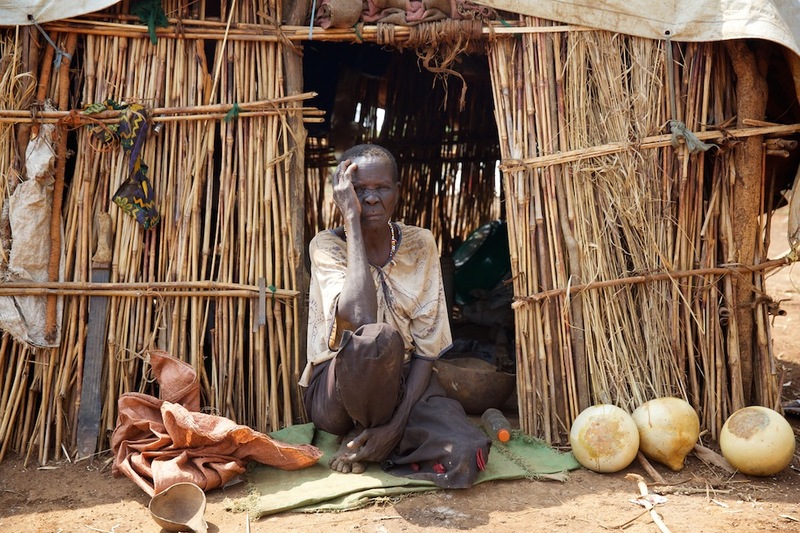 An elderly lady sits outside her makeshift home in the Akula community in Gambella. 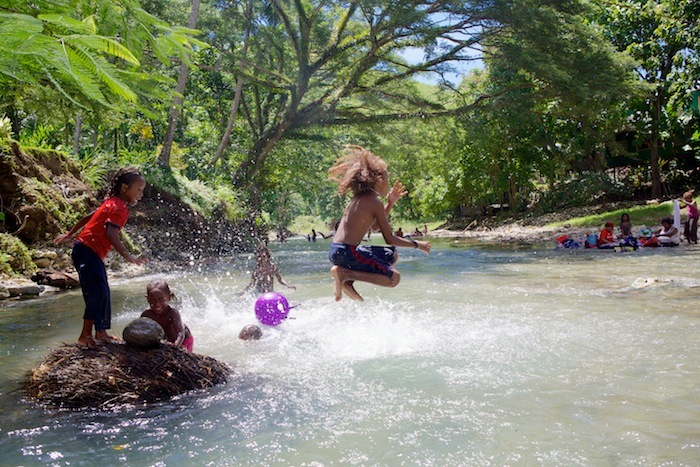 Children walk back from a water point in Akula. 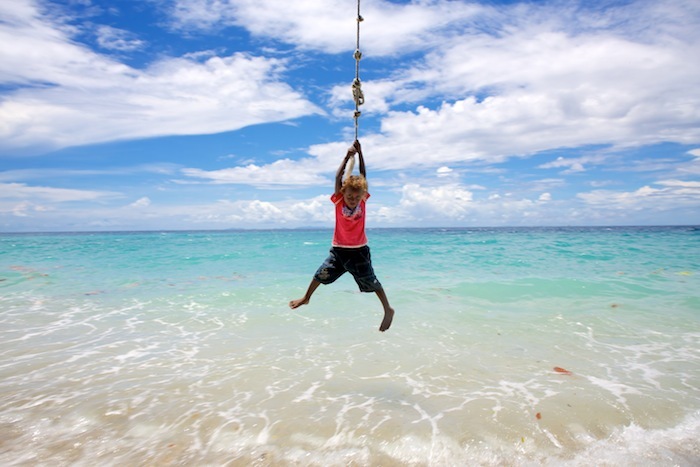 Children are particularly at risk from diseases. A view over part of Tierkidi refugee camp, hosting almost 50,000 south Sudanese refugees, mostly from the Nuer ethnic group in the Gambella region of western Ethiopia. Act for Peace partners EOC DICAC are working in response to the south Sudanese refugee crisis by assisting refugees in the areas of education, non food items, vocational training, household latrines and youth programs. They work in many of the main camps as well as some host communities. Noyakume (18), who arrived from South Sudan in April 2014 sits outside her home in Tierkidi refugee camp. 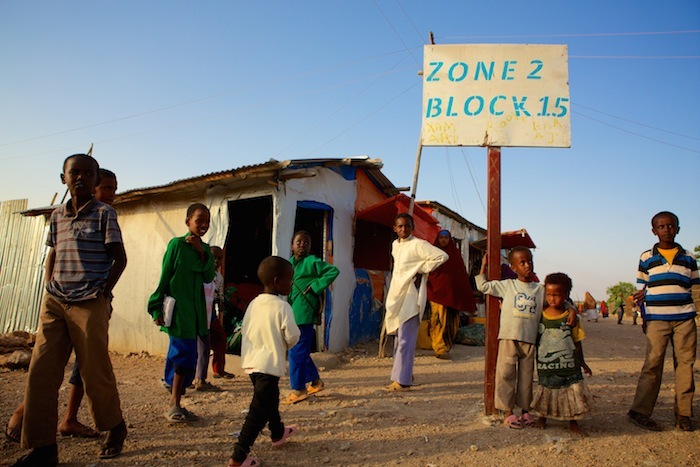 With no secondary school in the camp her education is at risk. Noyakume, who wants to be a teacher and likes English said, ‘You need education to be able to do something in your life.” Act for Peace partners EOC DICAC are building a secondary school in the camp. Ethiopia teacher Ashebir Tamiru (29) teaching physics at the DICAC run secondary school in Pugndo camp to newly arrived south Sudanese refugees. 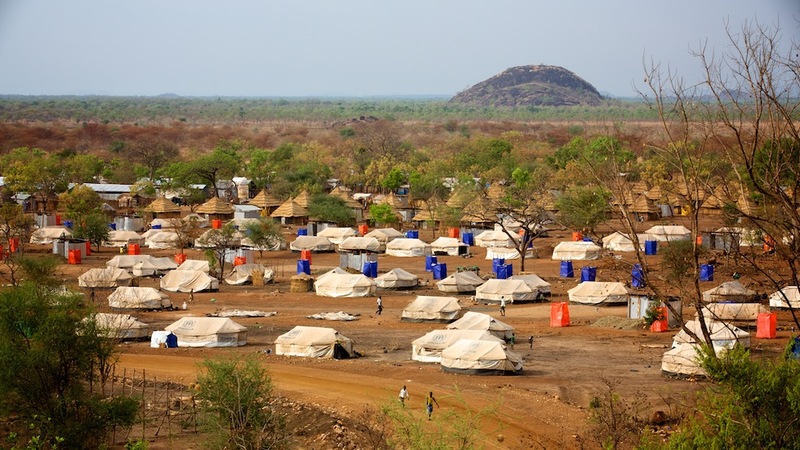 Pugndo camp is hosting over 55,000 refugees, mostly from the Nuer ethnic group in the Gambella region of western Ethiopia. Girls playing basketball in Kule refugee camp as part of the DICAC run Youth Program. Act for Peace partners EOC DICAC run the youth program in Kule along with community based psychosocial support. 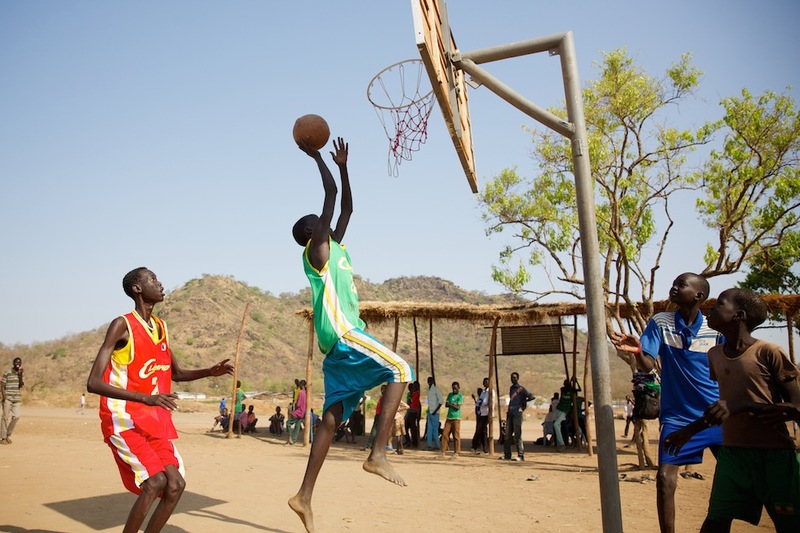 South sudanese refugees play basketball in Kule camp as part of the DICAC run Youth Program. 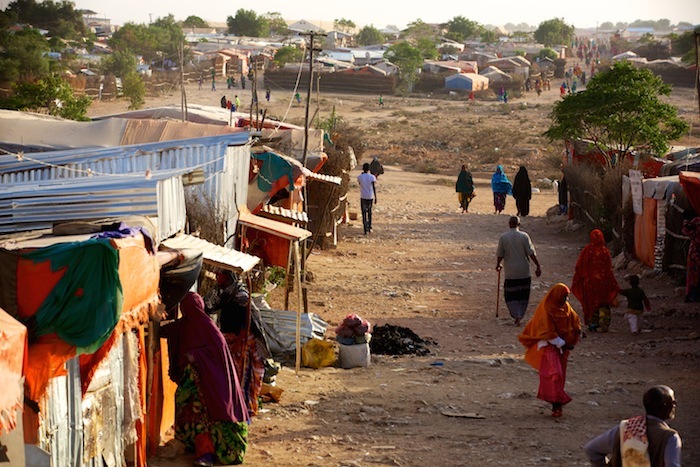 Kule refugee camp is hosting over 45,000 refugees from south Sudan. 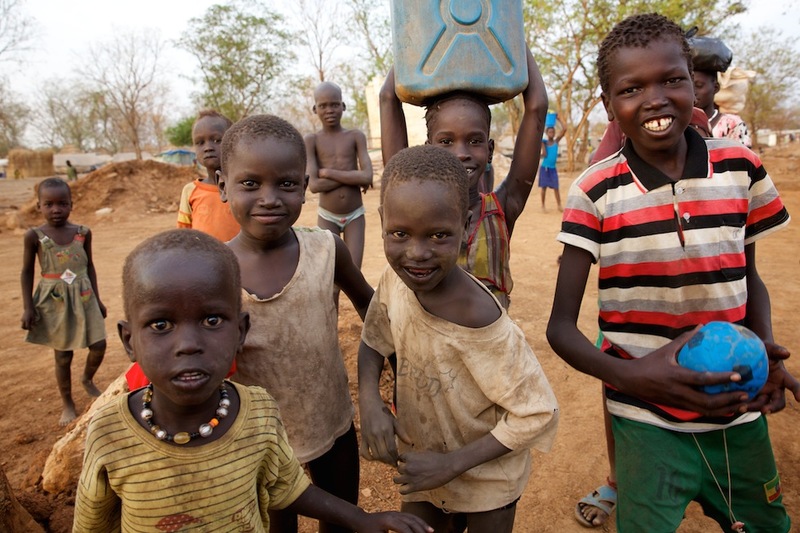 Children in Tierkidi camp that is hosting almost 50,000 south Sudanese refugees, mostly from the Nuer ethnic group. At the moment there are no educational opportunities for refugees from Grade 9 onwards so Act for Peace partners DICAC are building a secondary school in the camp. 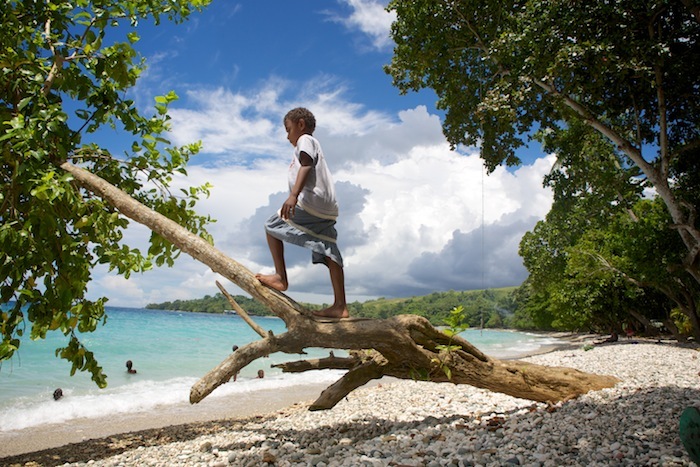 Last year I made my first visit to PNG, a country that has always been on my must go to list. A quick night stop in Port Moresby, an internal flight to Mt Hagen then a two hour drive up into the hills saw me arrive in the community of Grisa, located in the Banz area of Jiwarka province. I was there to meet Dominic, a community member from Grisa and Sister Regina, who have been running a project called Community Conversations since 2007. 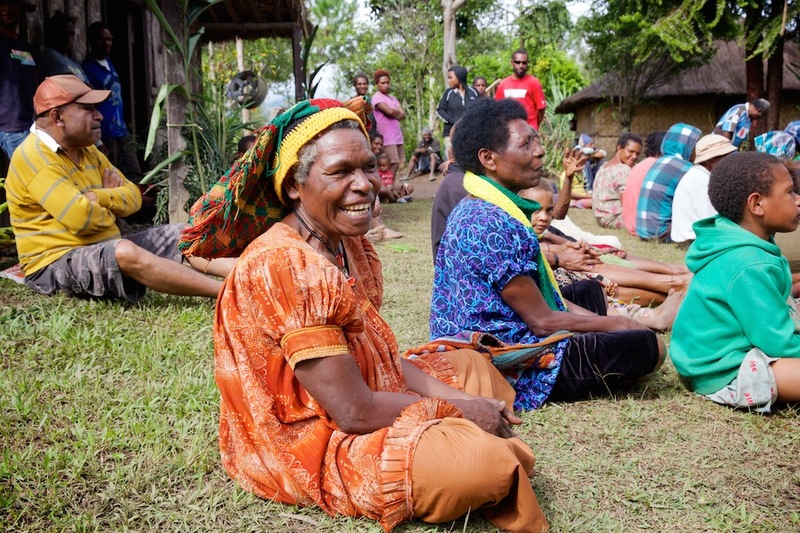 The aim of the program is to help create safe spaces, facilitated by trained community members, so everyone in the community can discuss the key issues they face, such as violence, HIV or other issues they have identified. Dominic was one of the first volunteers on the program. 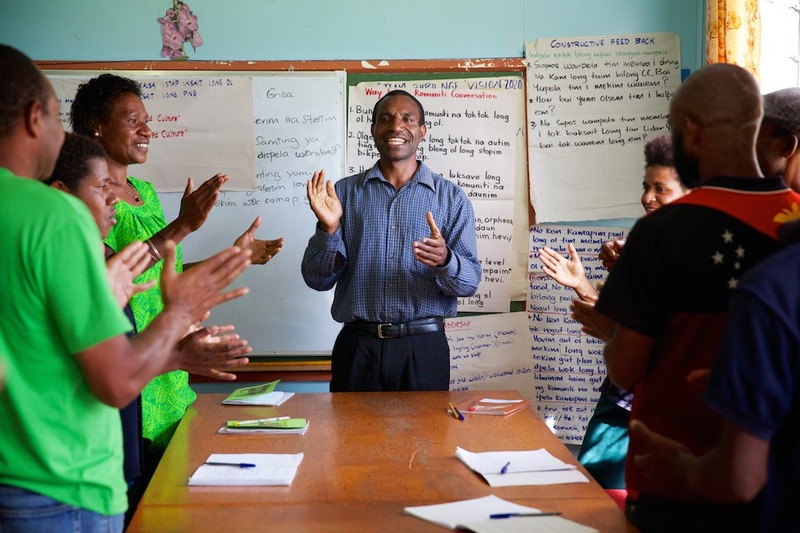 Through the training, he learnt communication and problem-solving skills that helped him lead open, respectful community discussions in his village. These stills and video were shot on assignment for Caritas Australia as part of their Project Compassion 2016 appeal. 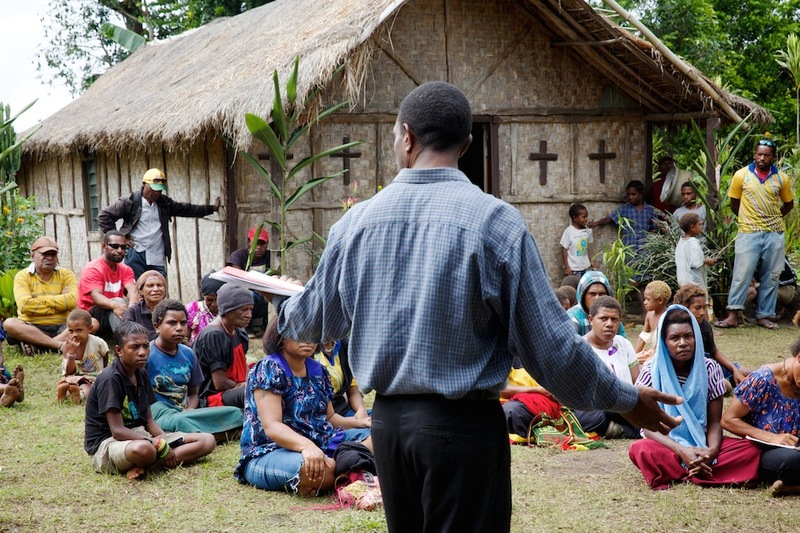 Dominic facilitating a Community Conversation session in his home village of Grisa in the Banz area of Jiwarka Province, Papua New Guinea. 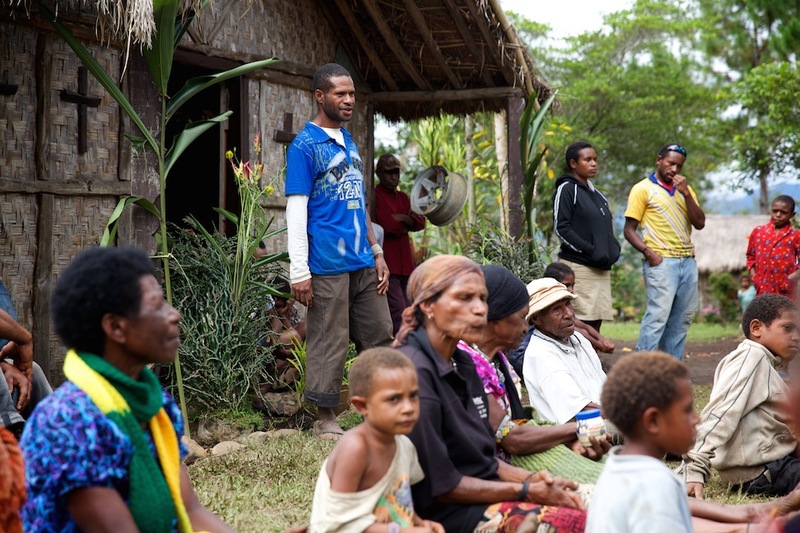 Community Conversations – Papua New Guinea from Richard Wainwright on Vimeo. A lady laughing during a role play put on by Dominic and other facilitators during a Community Conversations session in the village of Grisa. Dominic with students and facilitators wade across the Mobal river which separates his home village of Grisa and the Sisters of Notre Dame where the Community Conversations workshops are held. 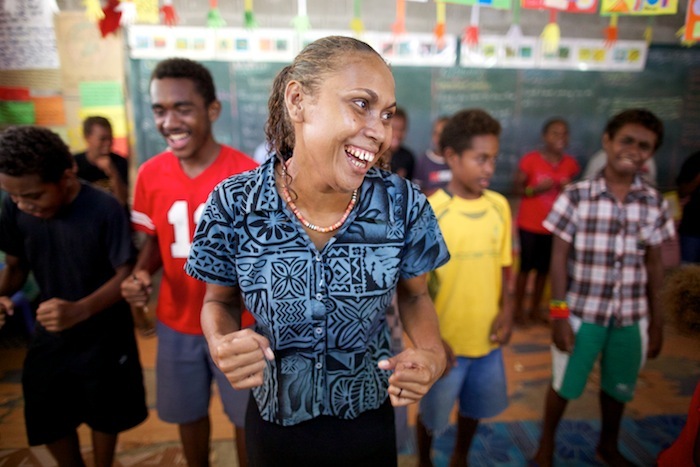 Grisa was the first village to participate in the Community Conversations program and since starting they have seen many positive changes such as reduction in domestic violence and better gender equality. 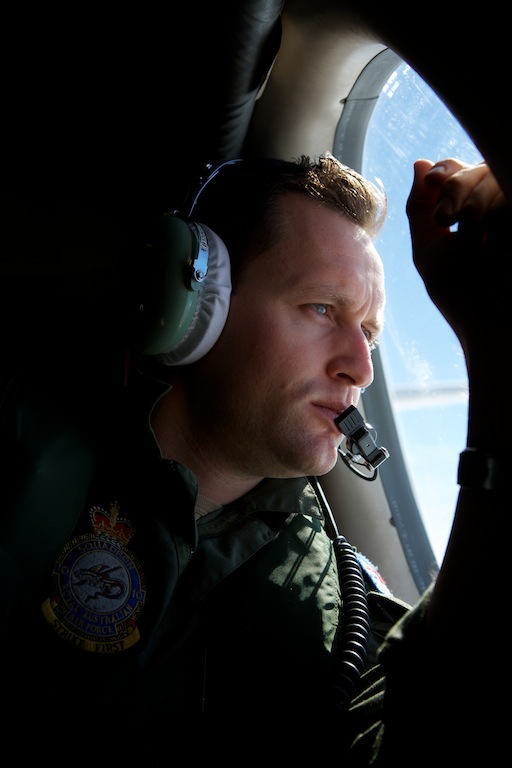 “Now everyone, women and young people, have a voice and peace is maintained that way.” – Dominic. John Kaa a community member of Grisa village making comments about the role play he had just watched about gender inequality during a community conversations session. 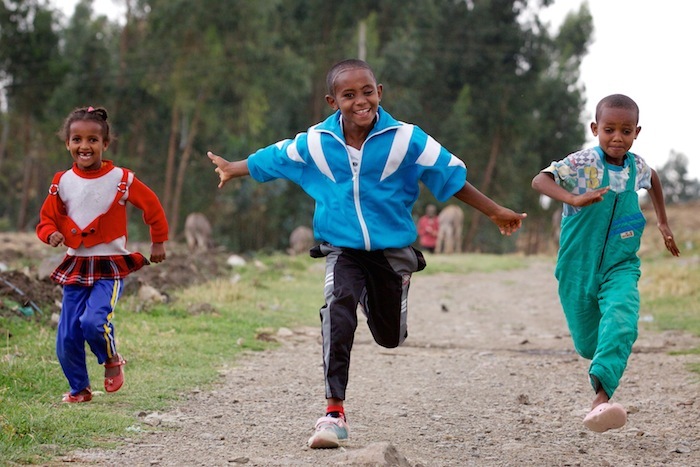 Children play on a road the community hand built to connect their village of Grisa to the main highway. The project to build the road started after a Community Conversations session identified self reliance and connectivity as key ways of improving life in their village. 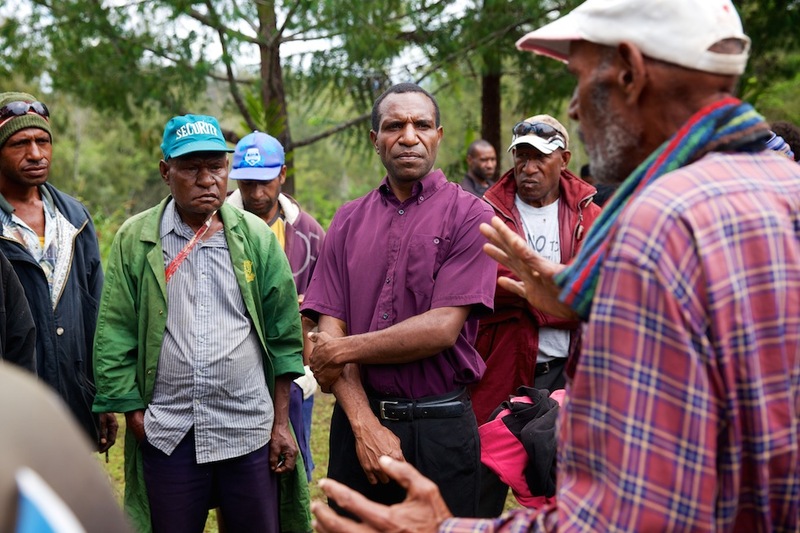 Dominic listening to community members in their home village of Grisa in Banz area of Jiwarka Province, Papua New Guinea. “They are now using money wisely, purchasing clothes for the children, paying school project fees, and basic necessities as salt and cooking oil.” – Dominic. Dominic facilitating a Community Conversation session in his home village of Grisa. This session helped demonstrate to students who were on a week long Community Conversations workshop how the sessions are run. 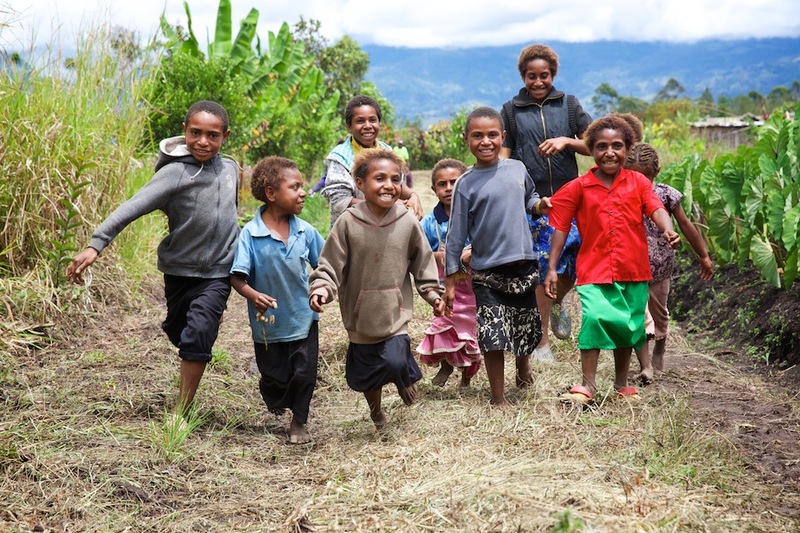 Children play whilst community members gather for a meeting in their home village of Grisa. 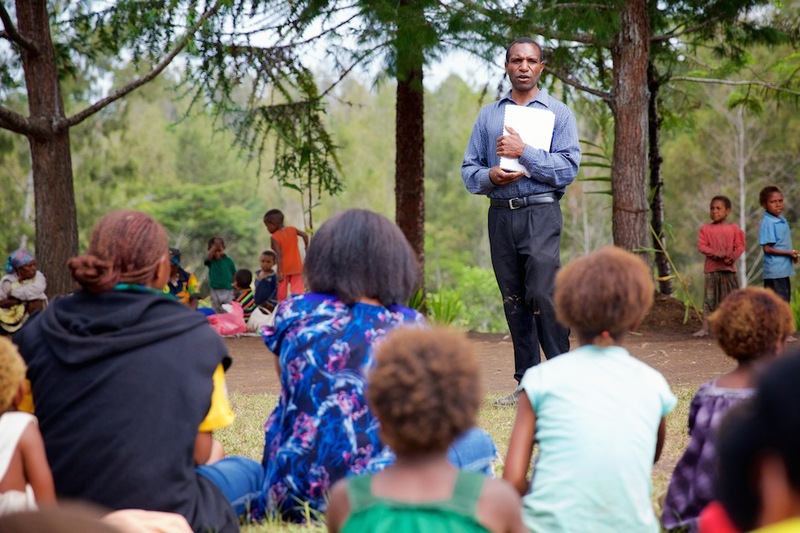 Whilst I was there, Dominic was helping teach on a week long workshop for community volunteers who wanted to hold Community Conversation sessions in their own villagers. 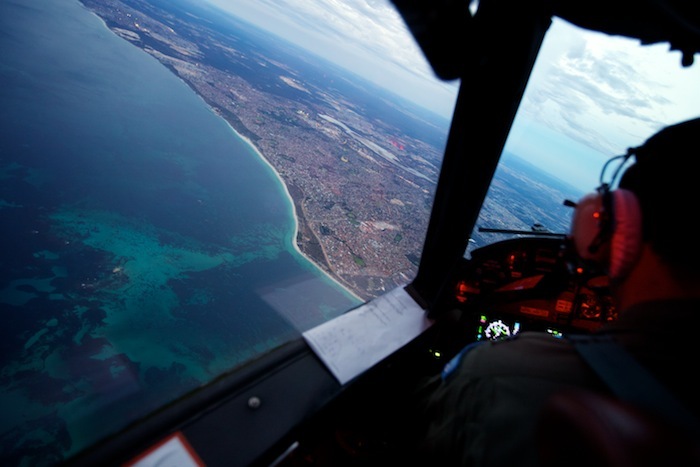 Ranging from teenagers to adults, most of the volunteers had either experienced or had been involved in many of the issues that beset these remote communities. “I have seen changes in people’s lives and feel very proud. As a facilitator of Community Conversations I feel proud that I can contribute something to the community meaningfully.” – Dominic. 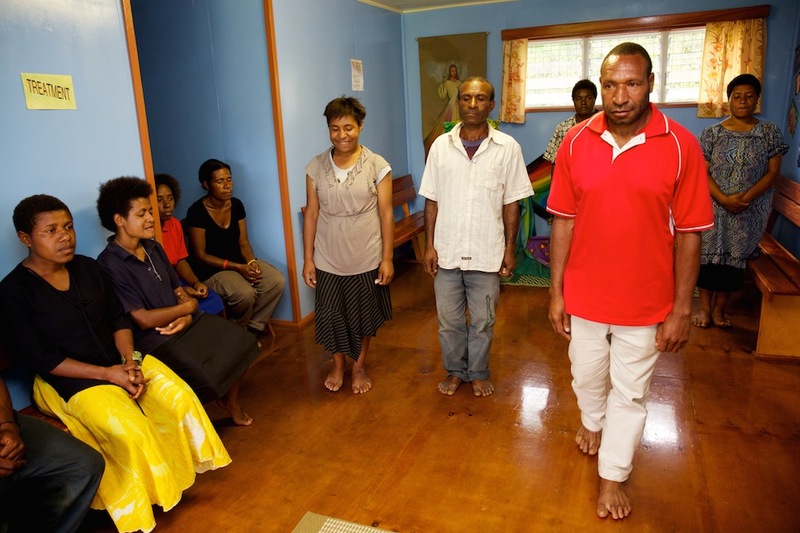 Dominic conducting a training session with other facilitators and students during a week long Community Conversations workshop held at The Voluntary Counselling and Testing Centre at the Sisters of Notre Dame in the Banz area of Jiwarka province, PNG highlands. 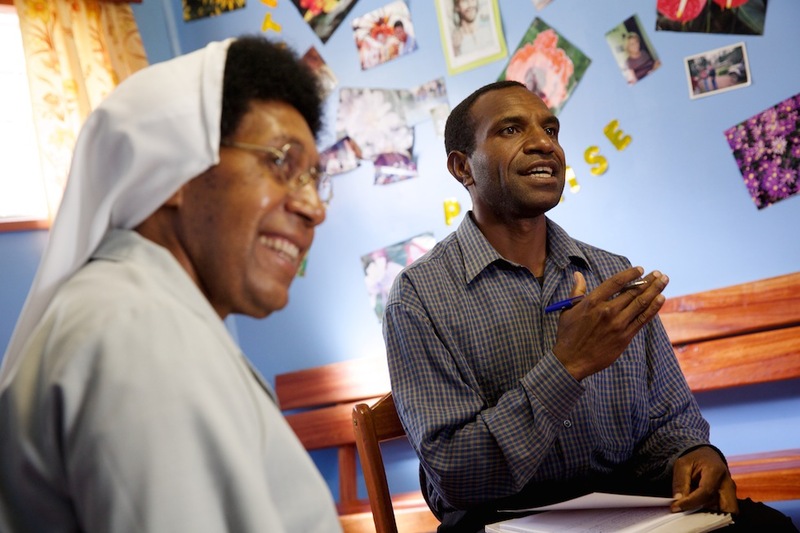 Dominic with Sister Regina Marie Wamp, the Community Conversations Coordinator discussing the days program during a week long Community Conversations workshop. Dominic conducting a Power Step training session with other facilitators and students during a week long Community Conversations workshop. 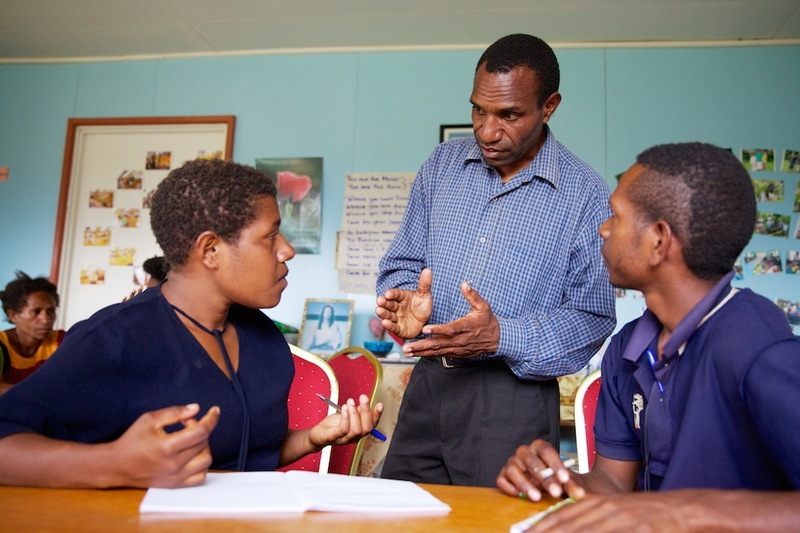 Having felt the impact the program has had on his home village, Dominic is confident that Community Conversations can make a difference to other communities. “Firstly, attitude must change and people should realise their potential and power they have within to develop their province and country as a whole. 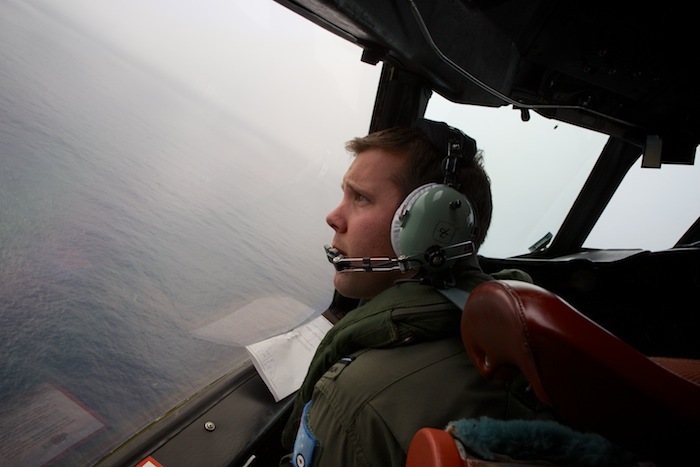 I am not a leader or politician but I believe this can be achievable.” – Dominic. Dominic talks with students Ethally (22) and John (20) during a week long Community Conversations workshop. They volunteered to be part of the program and will return to run sessions to help identify and overcome their own communities issues. 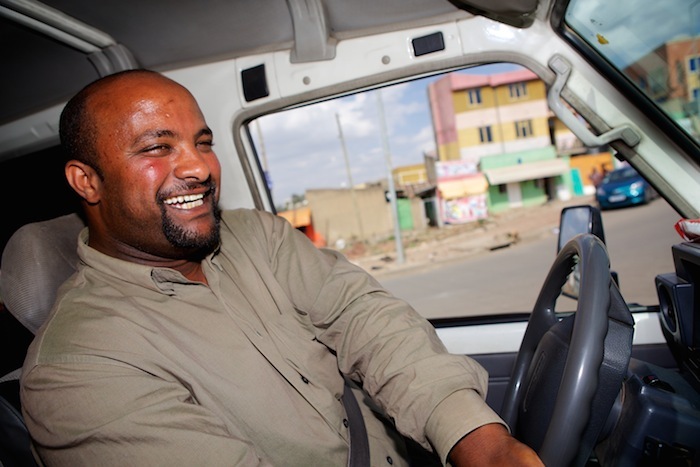 “I find much happiness when I see my community in peace, and my children safe.”- Dominic. 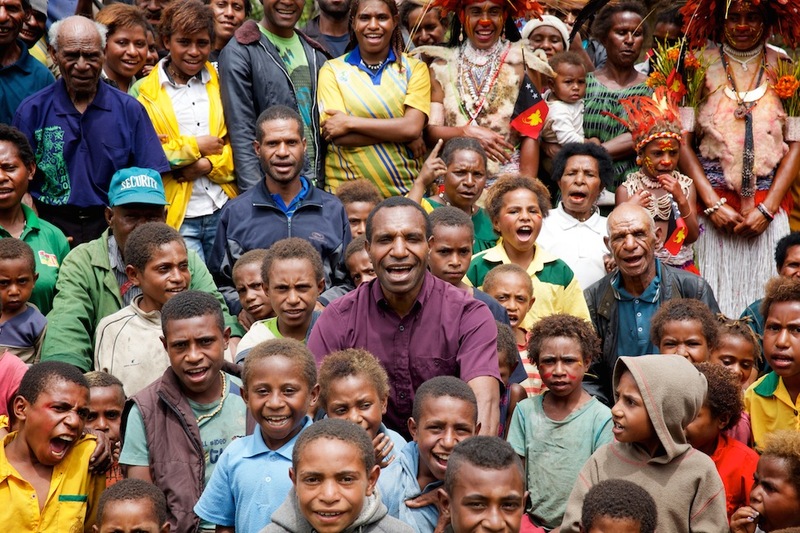 Dominic surrounded by community members in their home village of Grisa in Banz area of Jiwarka Province, Papua New Guinea. 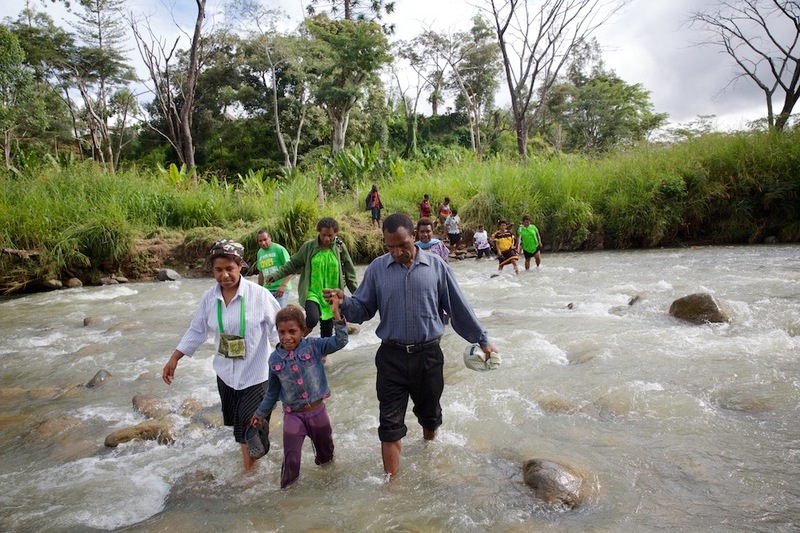 All of these photographs are copyrighted, so please do not use them without permission of the photographer or Caritas Australia. Once again it’s been some time since posting anything so a very quick update…! There have been a few Annual Reports and magazines that have recently been published featuring work I’ve been doing so thought I’d post them here. At the top is also a film I shot in Bangladesh. Nipa’s story: Her own boss from Richard Wainwright on Vimeo. 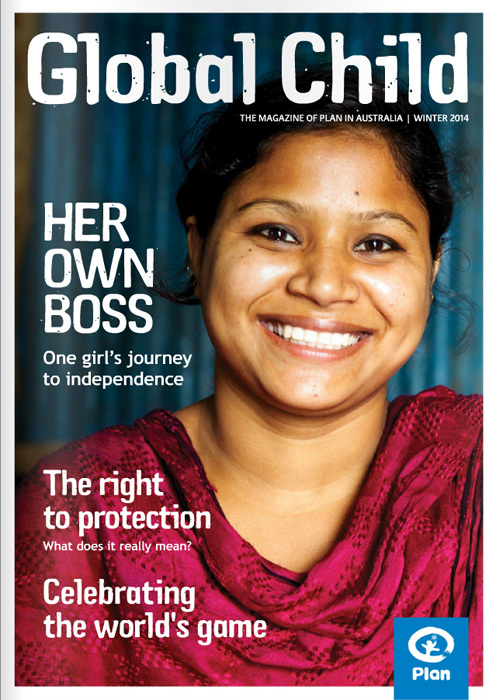 Plan Australia Global Child front cover featuring Nipa as part of a story on female entrepreneurs in Bangladesh. 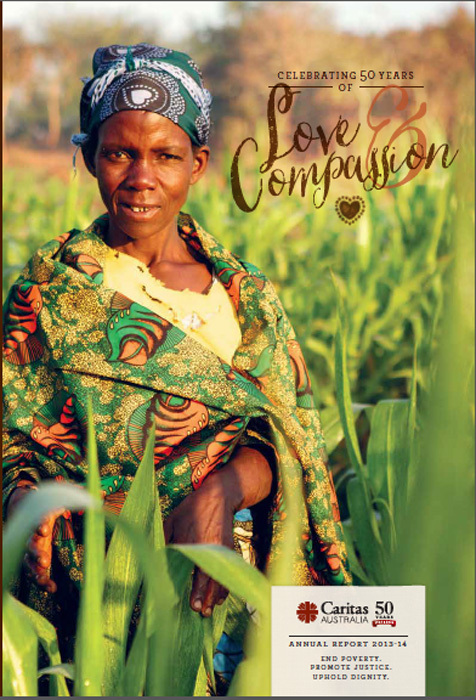 Caritas Australia Annual Report front cover featuring Esther from Malawi as part of a community farming program. 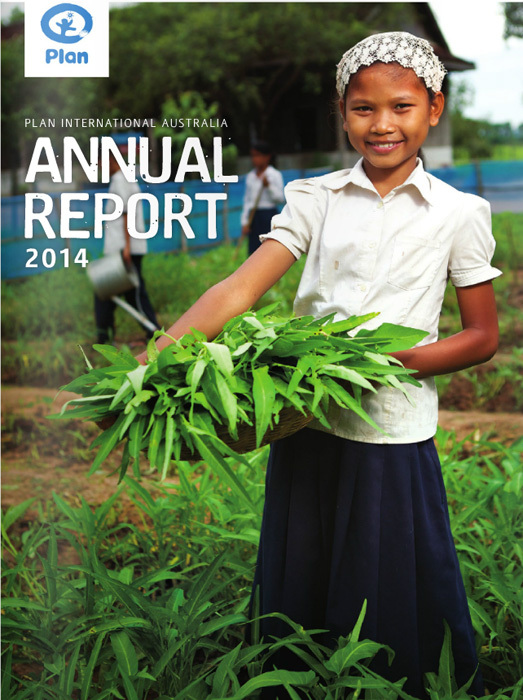 Samuan on the front page of the Plan Australia Annual Report. 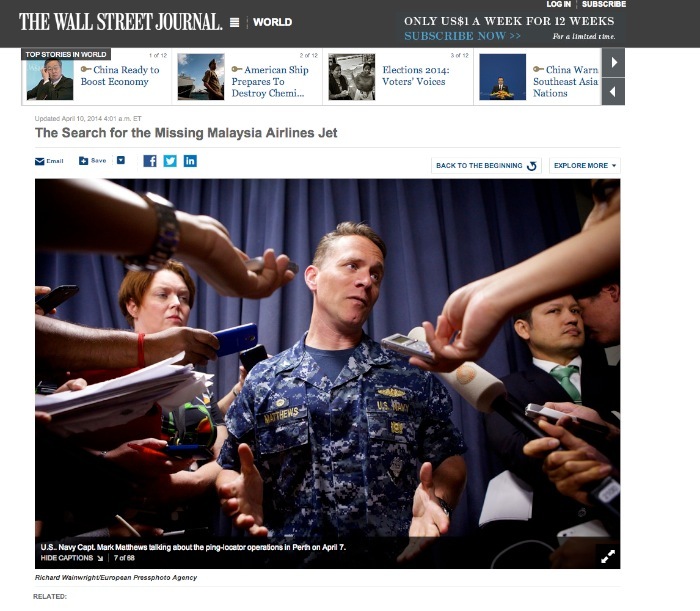 I was happy be selected as a finalist at this years WA Media Awards in the Best News Photograph category for my work on the Malaysian Airways MH370 search. 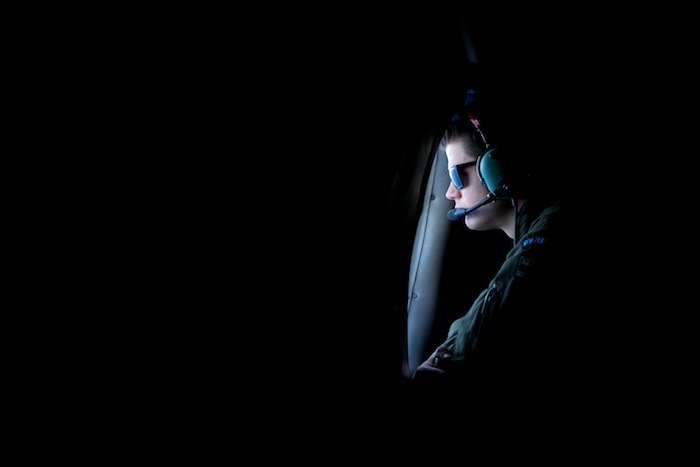 I was on assignment for the Australian Associated Press for three weeks based at RAAF Pearce airbase, going on 10 hour long missions with the RAAF and RNZAF on their PC-3 Orion aircraft to the southern ocean as well as trying to gain pool access to the crews arriving back and numerous press conferences. 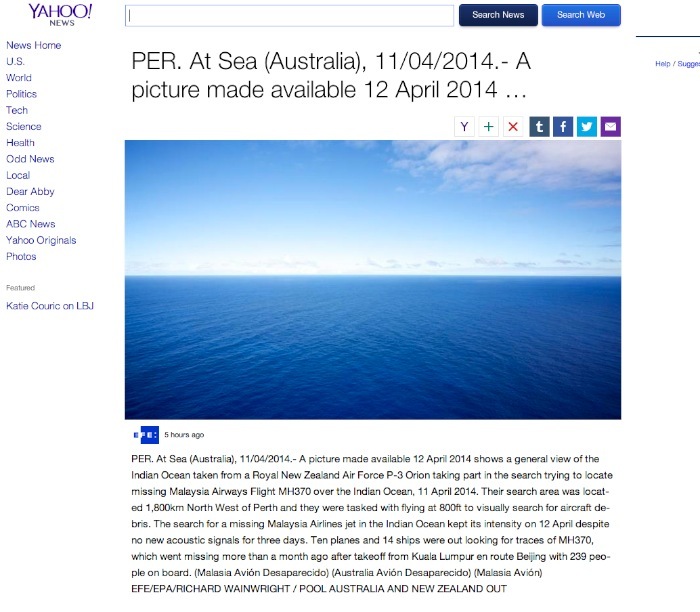 The search for Malaysia Airways MH370, which went missing whilst on a flight between Kuala Lumpur and Beijing on 8th March 2014, was the biggest international news story to descend on WA this year. 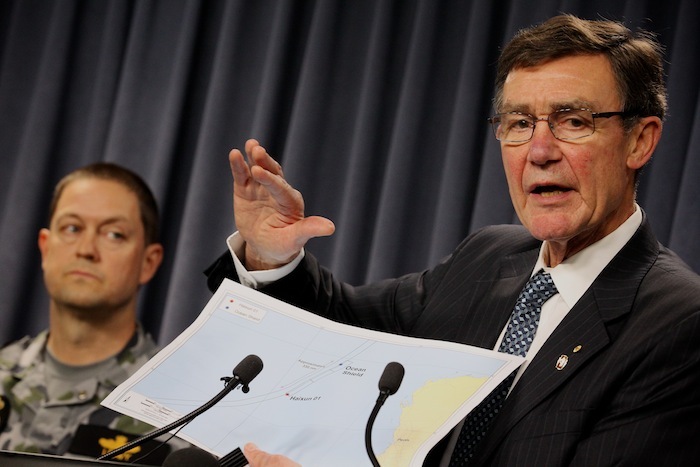 RAAF Pearce became the epicentre of both search and media activities with dozens of news crews from all over the world camping out desperately waiting for any information as aircraft returned from the search area each evening. 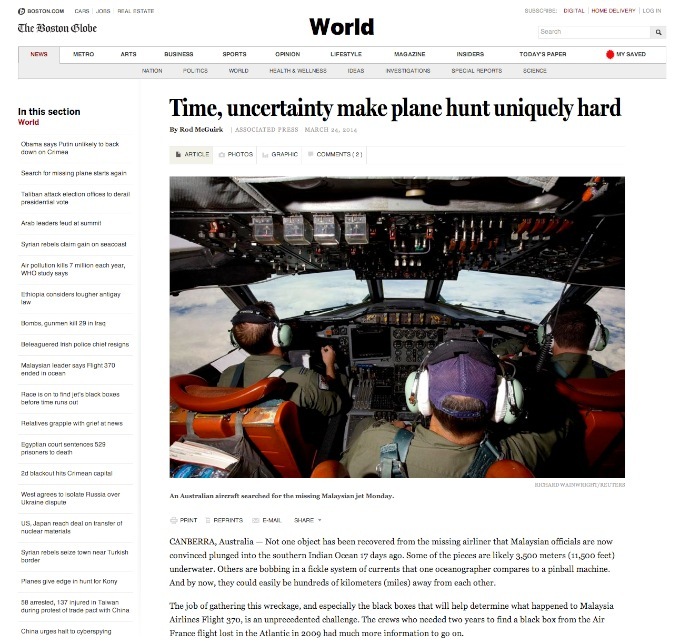 One thing that impressed me the most was despite the fact they were often flying in bad weather and on a gruelling rotation system, the enthusiasm and expectation from the aircrews that wreckage would be found and the victims’ families could receive some sort of closure remained until the last flights. 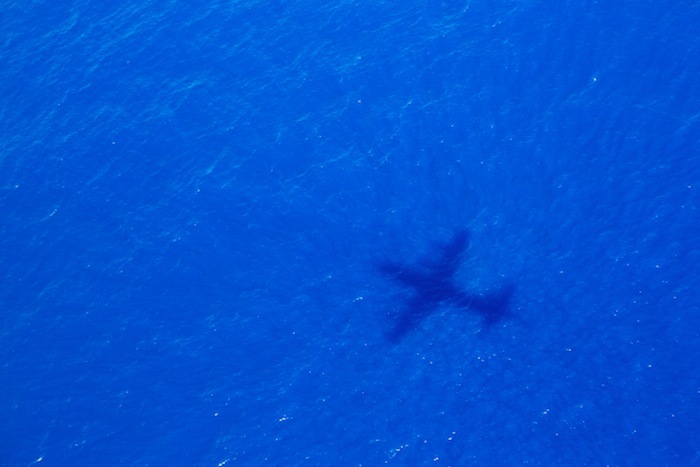 The aerial search was called off after weeks of searching and nothing being found and the disappearance of MH370 still remains a mystery.